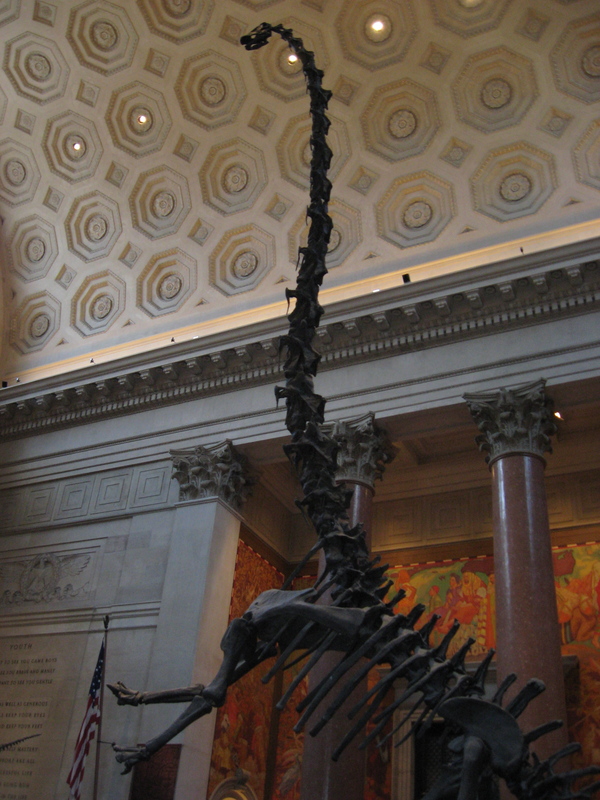 We’re in the home stretch of posts about my trip to the Northeast, with two more cities to go. It’s taken me as long to write all this stuff up as it did to see it. I must’ve picked up a nasty cold somewhere in New York, because by the time we got to Philadelphia the symptoms were on me in full force. We hit the trail anyway. 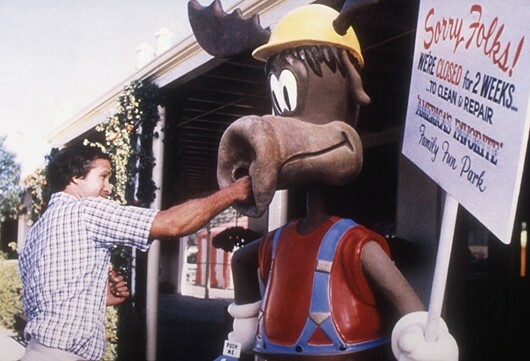 I’m a first-rate wuss, but it takes more than a runny nose and a sore throat to keep me from historical sightseeing. 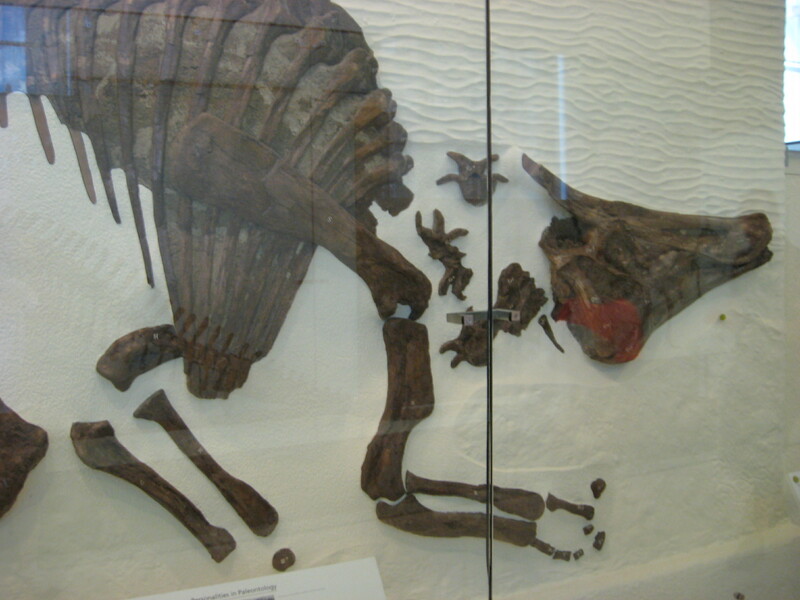 Something like the sequester, for example. 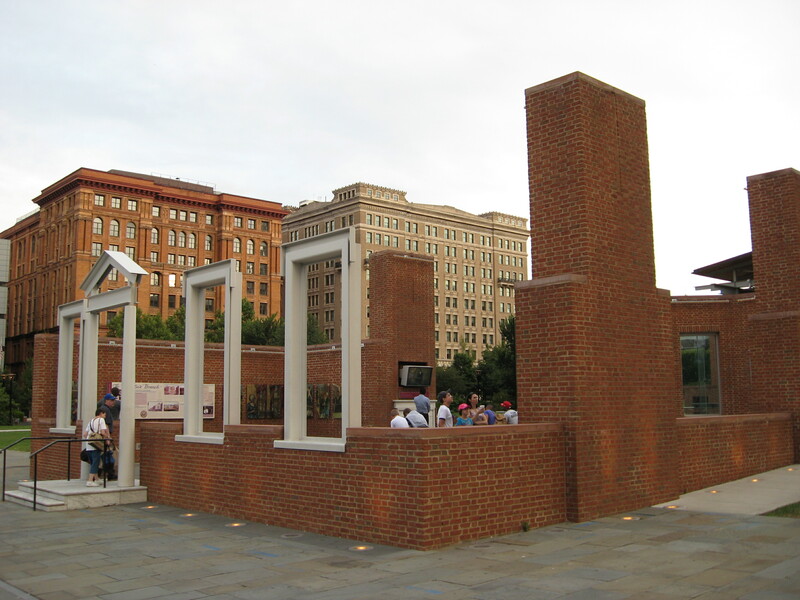 To explain how the folks in Washington put a real damper on this leg of the trip, I need to back up and give you a brief history of my previous visits to the City of Brotherly Love. 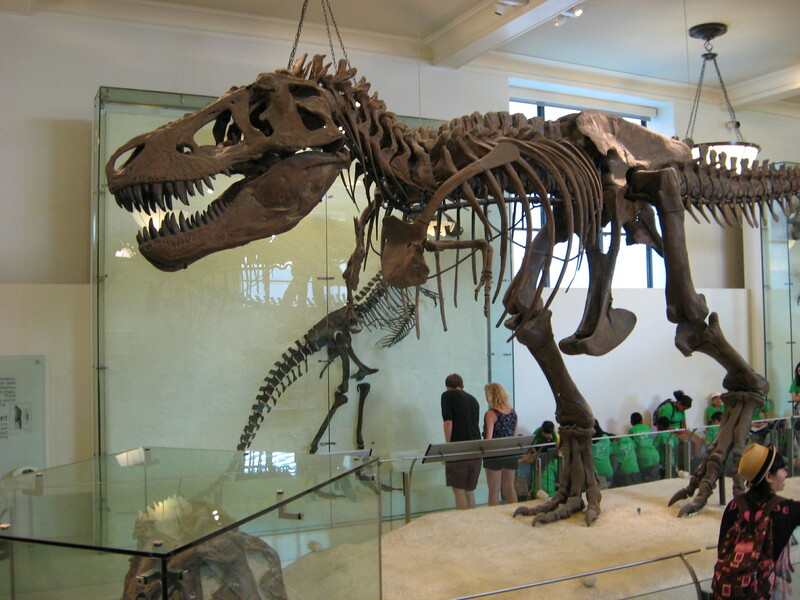 I was still in high school the first time I went there, accompanying my mom on a research trip. We were only in town for one day, so there wasn’t much time for sightseeing. 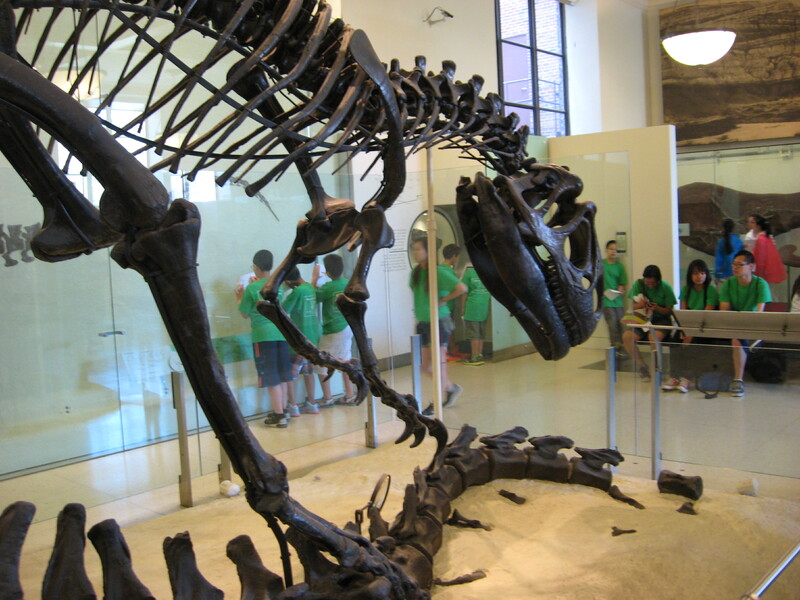 I got to pick one destination to visit, and it came down to either Independence Hall or the Academy of Natural Sciences. You’d think this would be a no-brainer for a Rev War buff, but at that time my history buffdom was still in its embryonic stage. Like our tiny mammalian ancestors, it scurried around in the underbrush, unable to compete for resources with the ginormous reptiles who took up all the good habitat space. 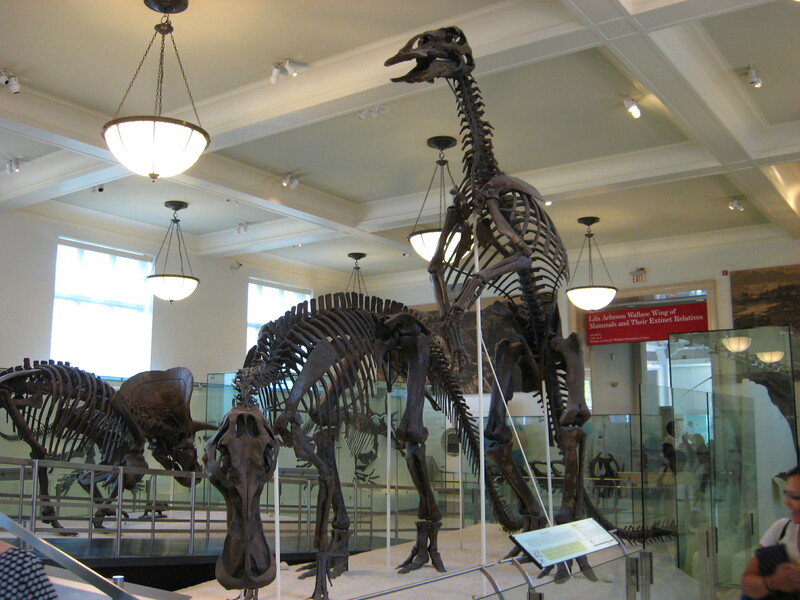 In this case, the ginormous reptile was a hadrosaur, the first major dinosaur find ever made in the U.S. and one of the star attractions of the Academy of Natural Science’s collections. 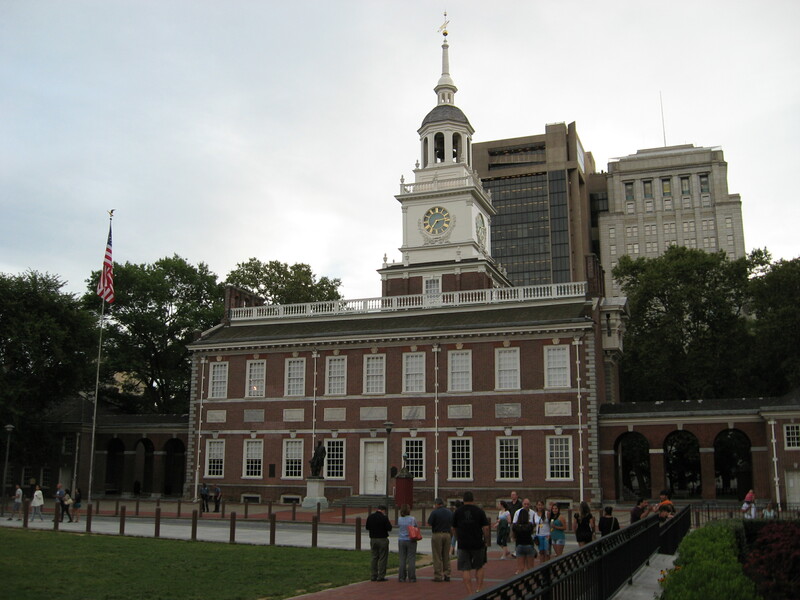 So I picked the ANS and vowed that if I ever made it back to Philly I’d see Independence National Historical Park. 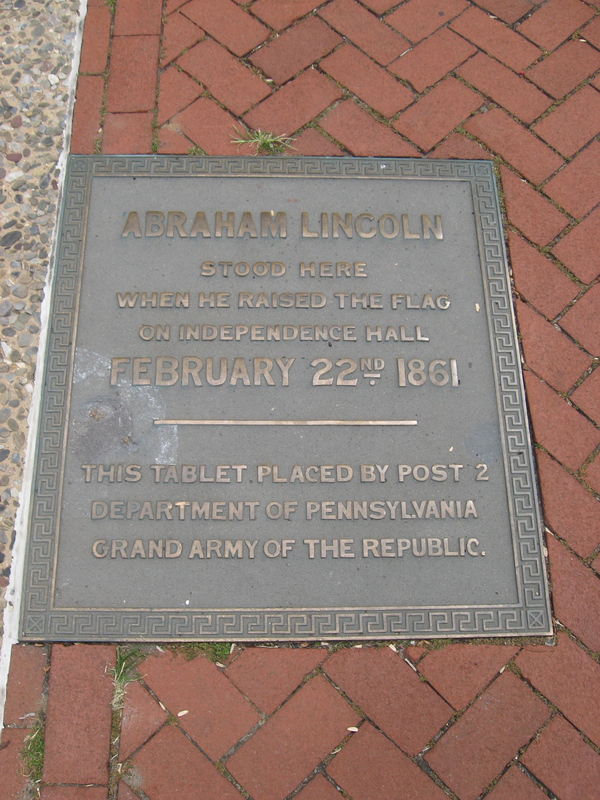 Many years later, I had to fly up to Philadelphia on a trip for the Lincoln museum. With a couple of hours to myself, I managed to hit Independence Hall, the Liberty Bell, and the buildings where Congress and the Supreme Court sat. 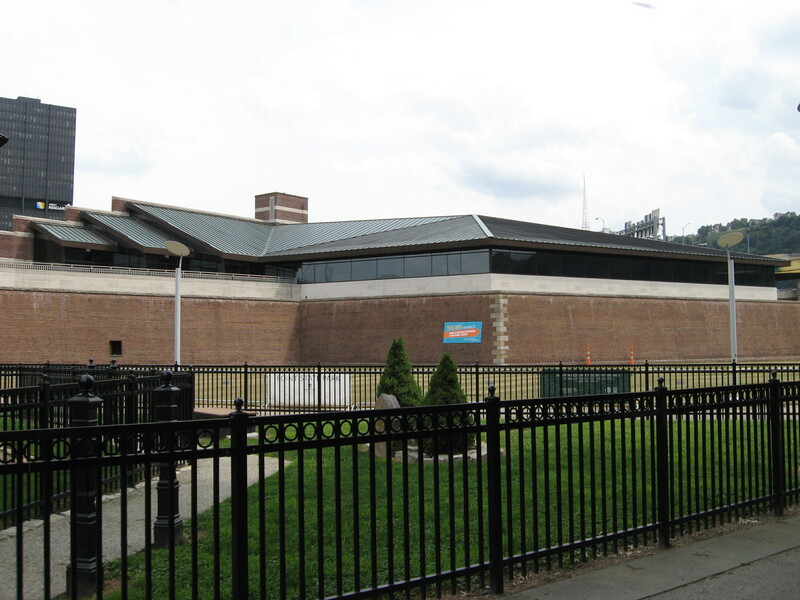 I’d really wanted to see the house where Jefferson wrote the Declaration of Independence, the New Hall Military Museum, and the gallery of Charles Wilson Peale’s portraits, but there just wasn’t enough time. Once again I left Philadelphia with unfinished business, promising myself that someday I’d be back to fill in the blanks. …it was sort of like that. Missing the Peale gallery was just plain bad luck; it’s only open on certain days of the week, and we happened to be there on one of the other ones. But I couldn’t figure out why the Declaration House and the military museum were off limits. 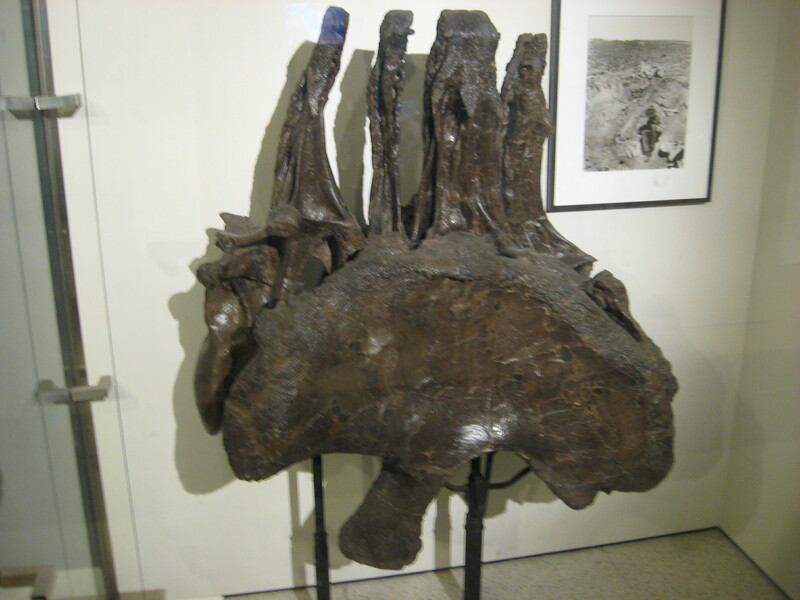 The park’s website gave no information. 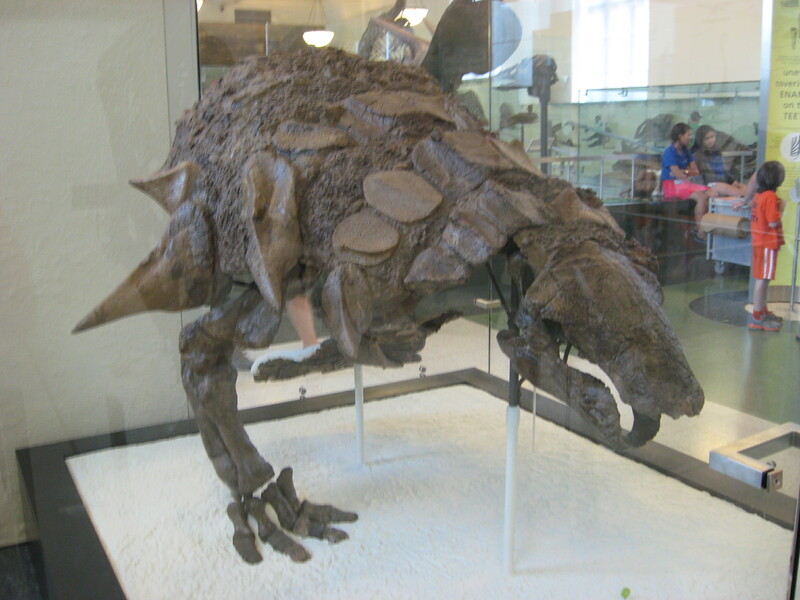 I wondered if the sequester might have had something to do with it, and apparently that was the case. On the off chance you ever read this, members of Congress and President Obama—thanks for nothing. 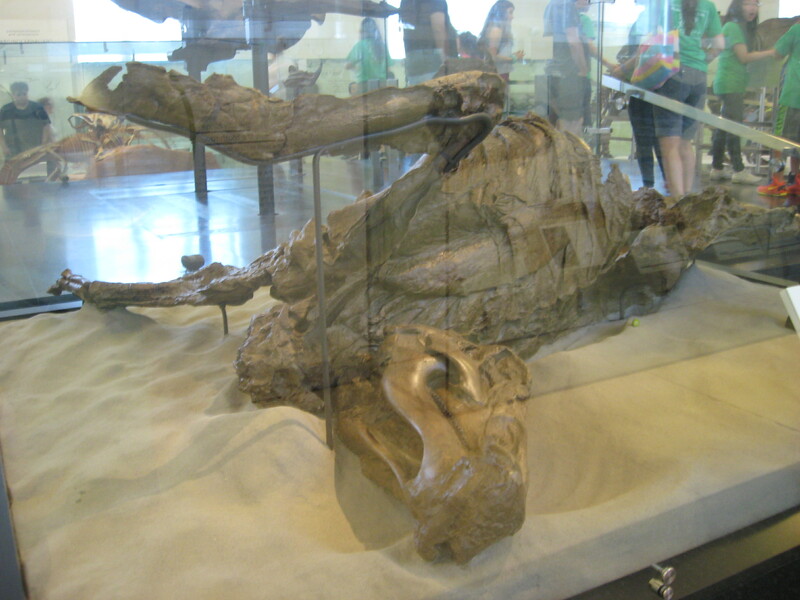 Still, an incomplete visit to INHP is better than a full visit to most places. It’s an awesome park. 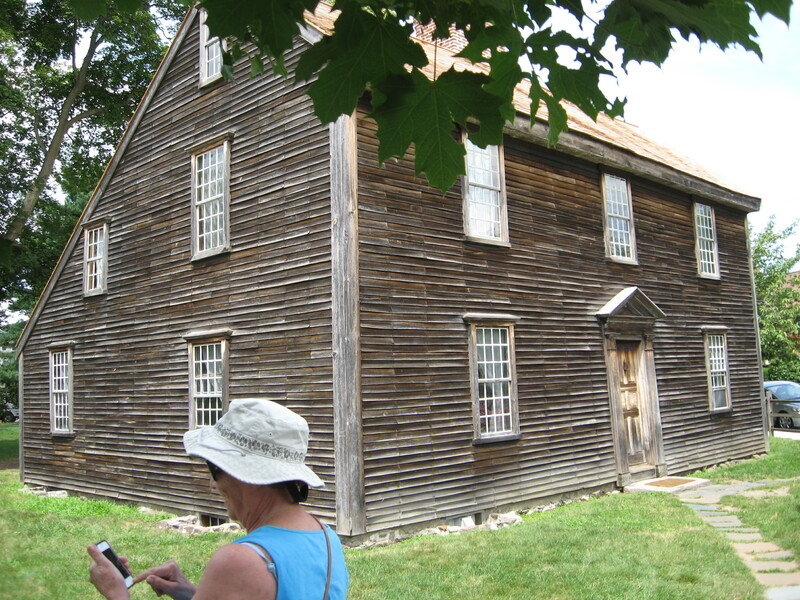 We did manage to see the reconstructed Declaration House from the outside. 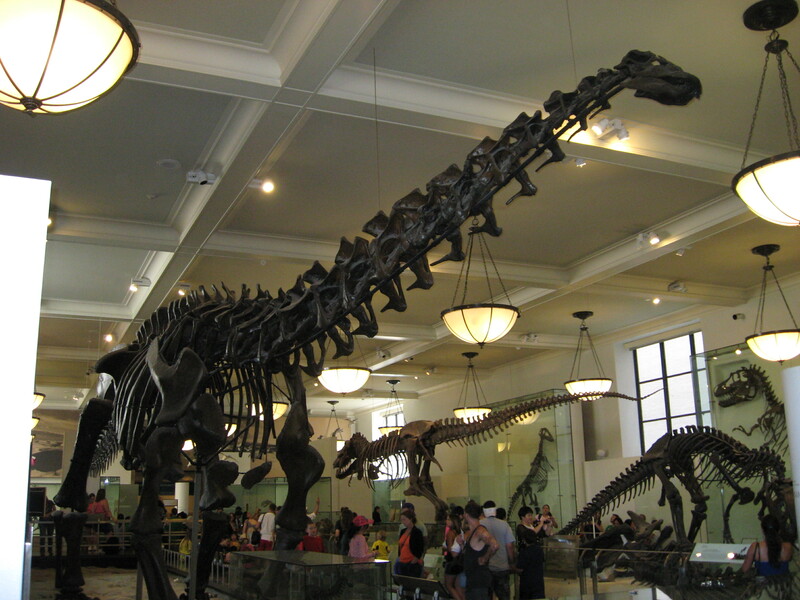 The original was demolished in 1883. And Independence Hall makes any trip to INHP well worth it, even if some of the other buildings are closed. People have been paying their respects here for a long time. The line to see the Liberty Bell was much longer than on my last visit, wrapping all the way around the outside of the building. I wondered if this was due to the fact that so many of the other buildings were closed. 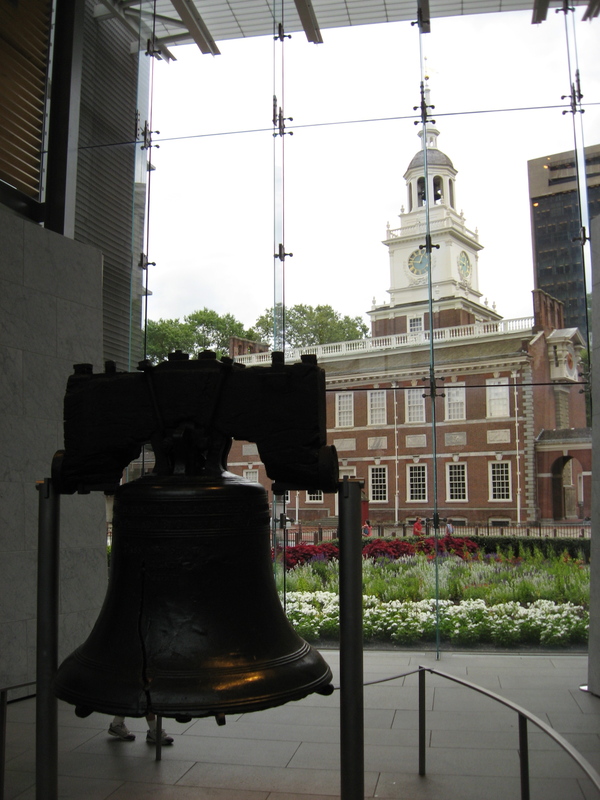 There’s a great exhibit in the building that houses the bell, covering everything from its manufacture to its evolution as a symbol of freedom and protest down to the present day. 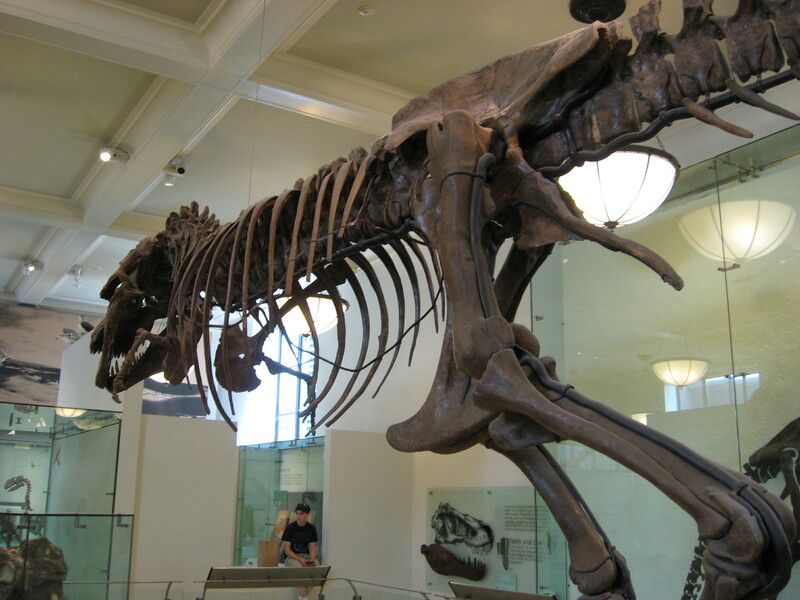 It’s a fascinating look at the development of historical memory. I didn’t get to visit Carpenters Hall on my last trip, so I was glad to see it this time. The interior is much smaller than I’d expected. We also walked through Christ Church Burial Ground. 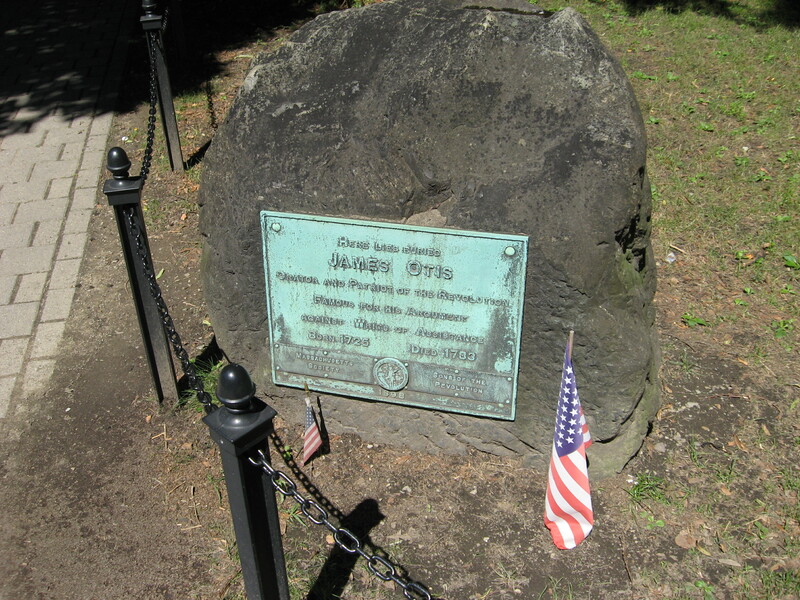 Five signers of the Declaration of Independence are at rest here, including Benjamin Franklin. One other feature at INHP was new to me, because when I first visited the park it hadn’t been built yet. It’s an outdoor exhibition called “The President’s House: Freedom and Slavery in the Making of a New Nation,” which opened in 2010 on the site of the house occupied by the President of the United States from 1790 to 1800. 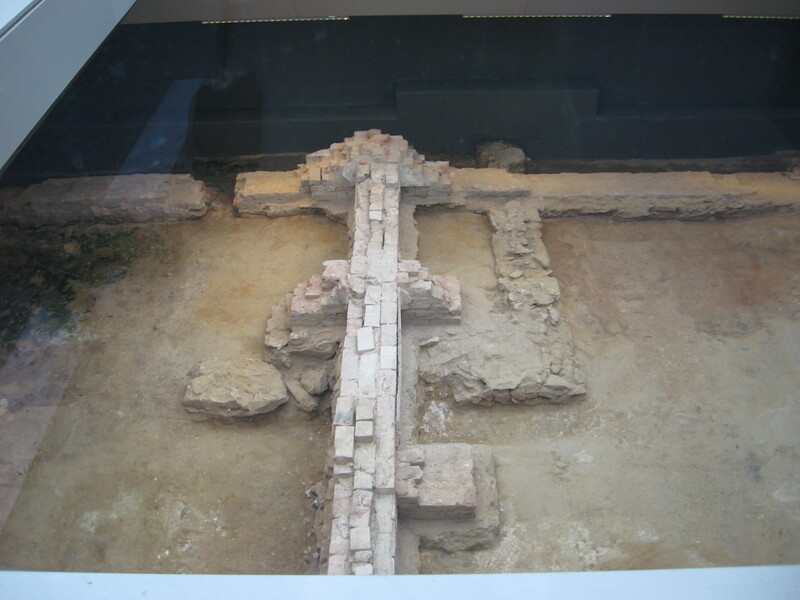 A sort of semi-reconstruction of the home’s facade marks the spot. 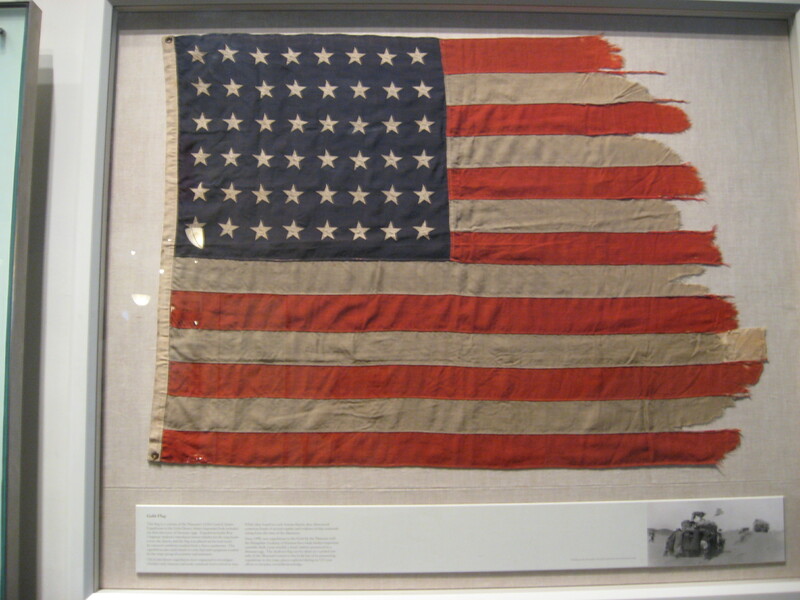 It’s an interesting case study in the intersection of memory, politics, and public history, and for that reason it’s worth examining in some detail. Excavations at the site, which revealed remnants of the presidential residence’s work areas, generated public calls for recognition of the slaves who lived and worked there. As of the time of my visit, the exhibit tells both the story of George Washington’s slaves and the story of the presidency’s beginnings…sort of. 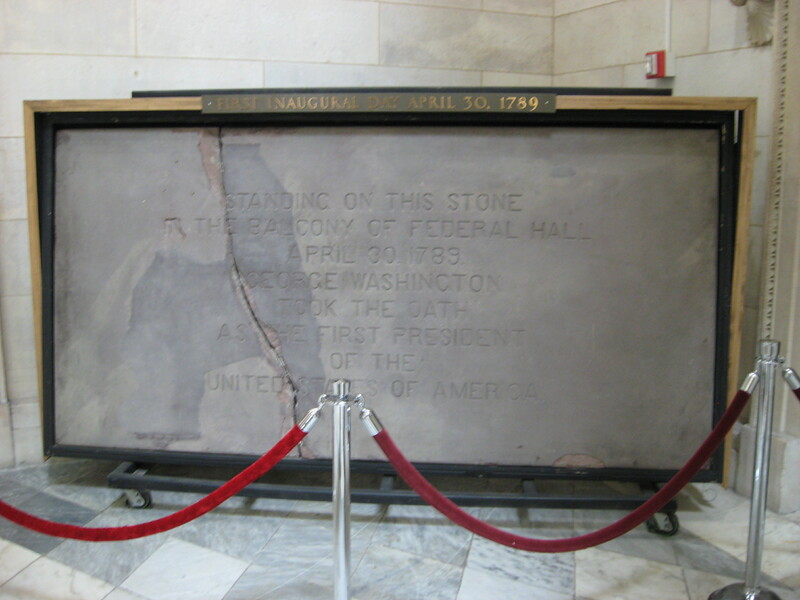 There are some panels with information about important events in the history of the presidency (the Jay Treaty, the Alien and Sedition Acts, etc. ), but it seemed to me that slavery was the main story here. Video screens run short films on Washington’s servants, and toward the rear of the structure you can look through a transparent floor at some of the house’s original foundations. 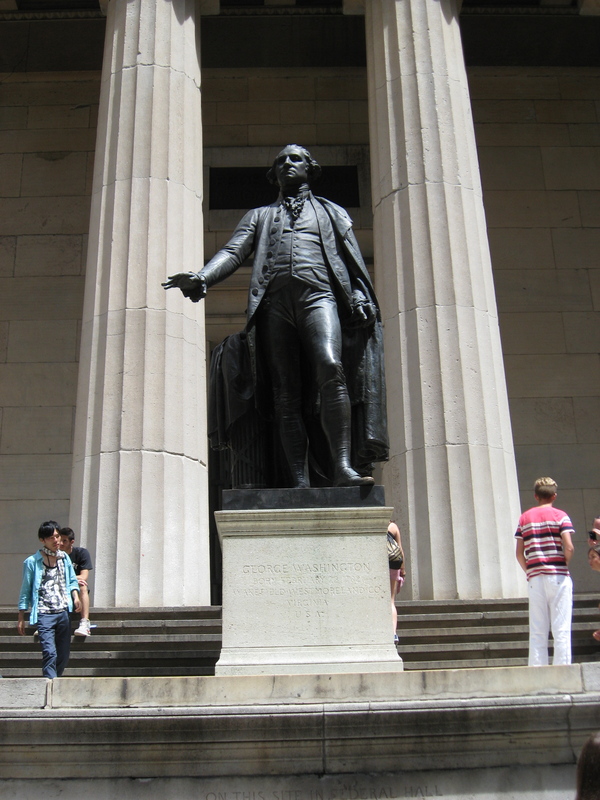 Washington’s time in Philadelphia definitely exposed the uglier side of his career as a planter. By a 1780 state law, non-residents could only keep their slaves in Pennsylvania for up to six months; after that, slaves of nonresidents living in the state were free. The law provided an exemption for members of Congress, but not for the president or federal judges. Washington managed to get around the prohibition by moving slaves in and out of Pennsylvania so that none of them were in the state for more than six months at a stretch, even though a 1788 amendment to the original law closed this loophole by prohibiting that very practice. Washington never came under legal scrutiny for these shenanigans, but his slaves still proved harder to hold onto in the capital city than he anticipated. 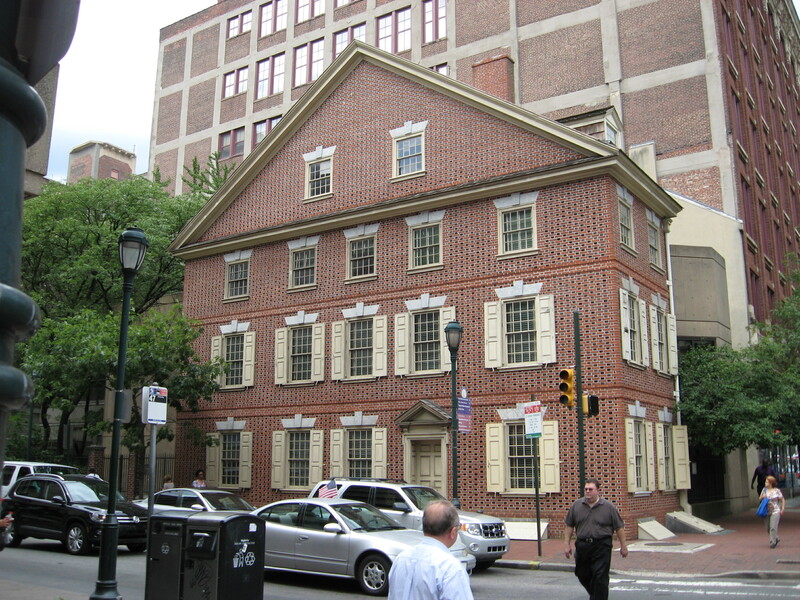 As he prepared to leave Philadelphia and return to Virginia, a young woman named Oney Judge (one of Martha Washington’s dower slaves) fled the household. Knowing that escape would be extremely difficult back in the Old Dominion, she used her connections among Philadelphia’s black community to make a bid for freedom and made it to New Hampshire, where she married a sailor and had three children. Washington’s efforts to recover her ended in failure, and she died a free woman—in practice if not by law—in 1848. It’s one heck of a story, and I’m glad the exhibit is telling it. At the same time, I couldn’t shake the impression that we were juggling two different topics, and not entirely successfully. The origins of the presidency and the role of slavery in the Washington household are both immensely important and very complicated subjects, requiring as much space and ingenuity as possible. The President’s House exhibit conveys the slaves’ story much more effectively than the story of the executive branch’s early development. This is a problem, because there aren’t many historical topics more consequential than the presidencies of Washington and Adams. Every decision, every measure, every bit of protocol established precedents that would shape American government for more than two centuries, and in some cases determined whether the U.S. would maintain its precarious existence or be caught up in the torrent of European war. I would’ve preferred the exhibit take its time and tell either one of these stories fully, either the bottom-up story of Washington’s slaves or the top-down story of the first two men to take the oath of office. To me, the limited space devoted to the top-down story only called attention to the fact that the coverage was so basic and limited, like an afterthought tacked on because there happened to be room for a few more exhibit panels. It was as if the interpreters were trying to cram in enough to please everybody, with the result that nothing got covered as thoroughly as it should have. 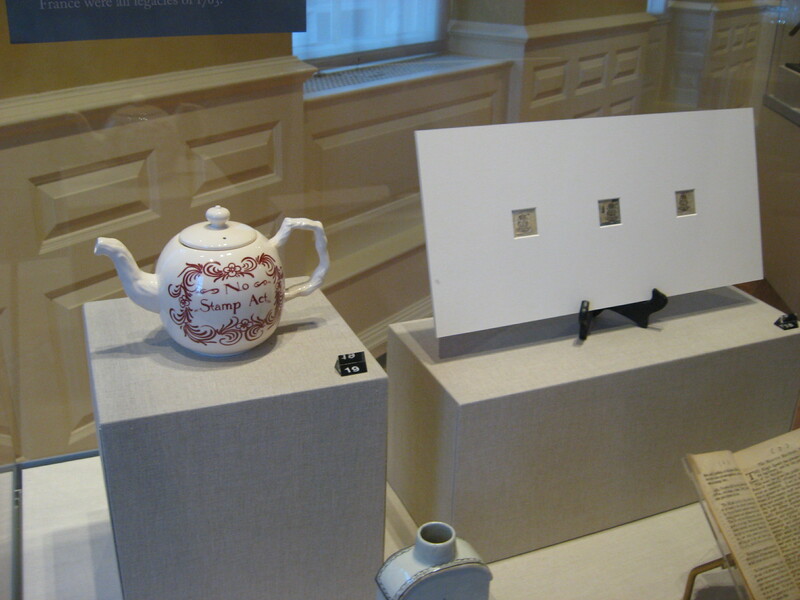 I realize that I’ve devoted more verbiage to my critique of the President’s House exhibit than any other aspect of INHP. I hope this doesn’t give you the impression that my overall assessment of the park is negative. Far from it; the only reason I haven’t discussed the park as a whole in the same detail is because the President’s House exhibit was new to me, and it raises all sorts of interesting questions about how we interpret historic sites. I consider the park as whole to be one of the crown jewels of the entire national park system. 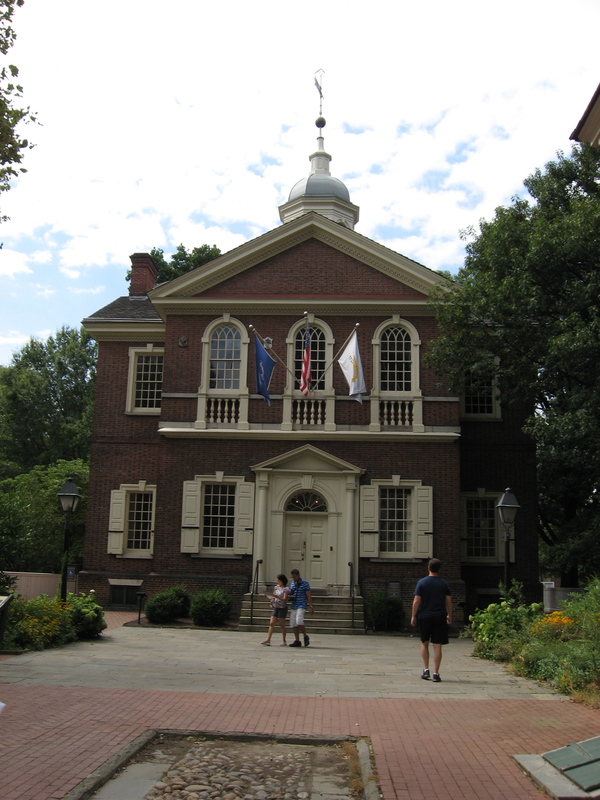 I’ve had two guided tours of Independence Hall and the buildings alongside it over the years, and both were among the best historic building tours I’ve ever taken. 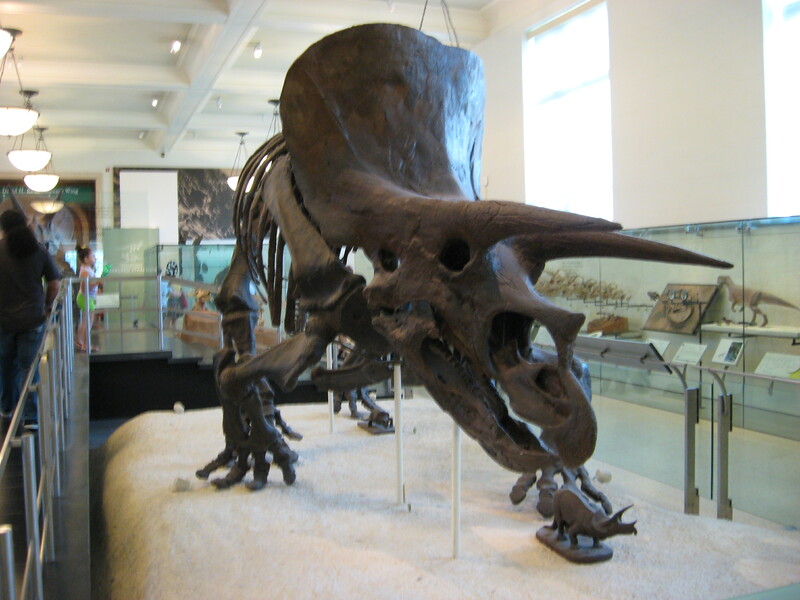 The rangers here are extraordinarily knowledgeable and engaging, the buildings are beautifully restored and maintained, and in terms of historical significance it might just outrank every other historic site in the country. 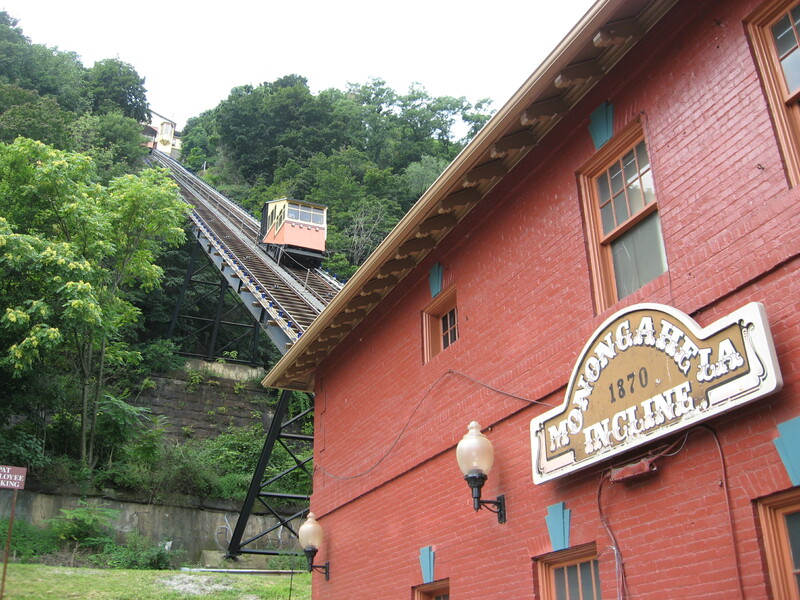 If you’re making a list of historic places to see in the U.S., this one should be at the very top. 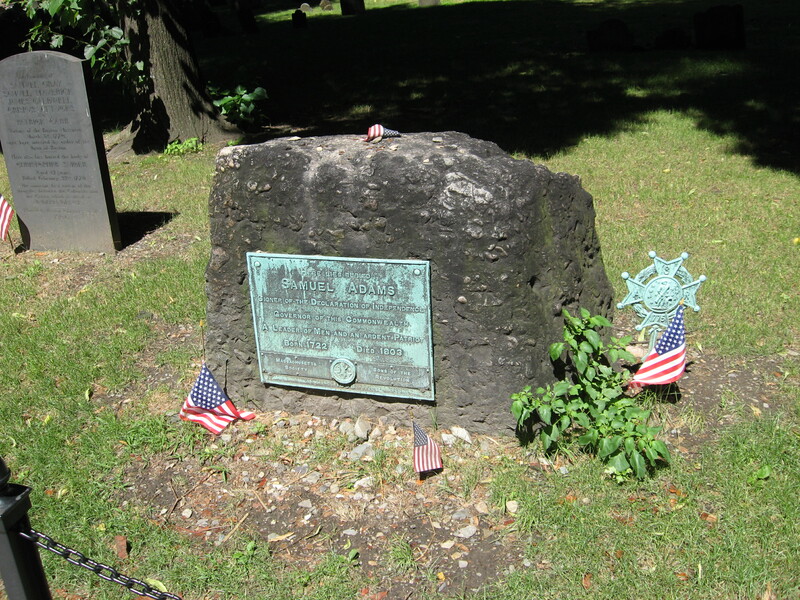 Ryan and I got a firsthand look at the revival of popular interest in John Adams when we tried to schedule a visit to Adams National Historical Park in Quincy, MA. We’d planned on an afternoon visit, but since tour tickets are limited and on a first-come, first-served basis we decided to call first. It’s a good thing we did, because every single tour for the day was already full, and we’d called not long after lunch. Capacity crowds aren’t unusual at the site. From what the staff told me, ANHP has been doing a brisk business in ticket sales for some time, ever since David McCullough and HBO made John Adams fun again. 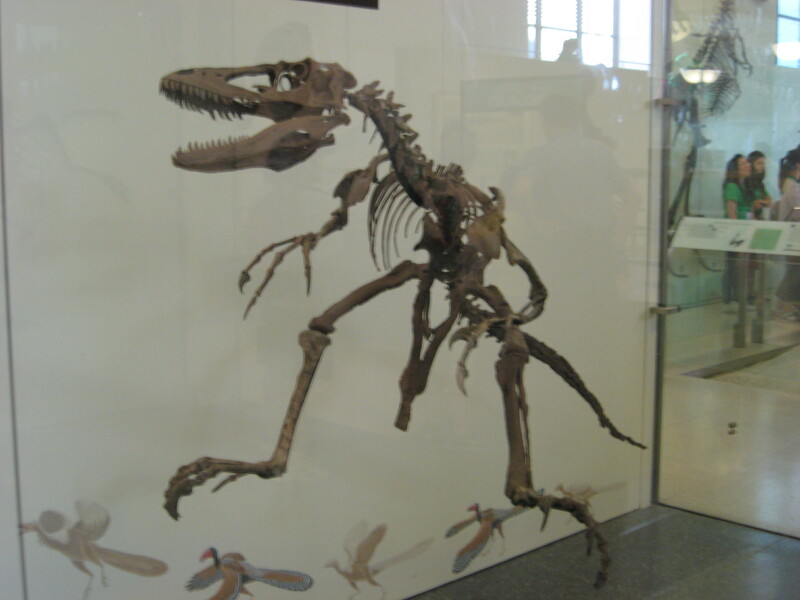 Or perhaps I should say they introduced us to a man who had always been fun. Adams had such a vivid personality, and expressed that personality so fully in his writing, that he’s the most flesh-and-blood of all the Revolutionary demigods. When you read John Adams, there’s no Washingtonian marble exterior to crack, no haze of Jeffersonian contradiction to penetrate. He jumps right down off his pedestal, pokes his finger in your chest, and spouts whatever’s on his mind. Irritating but engaging, stubborn but fiercely loyal and determined, he has all the makings of a great TV character. No wonder people flock to the places he lived. Anyway, we picked another day to visit and headed out early. It was worth the effort, because there aren’t many places where you can see two presidential birthplaces for the price of one, just as there aren’t many historic sites interpreted as well as this one. As of this writing, the visitor center is located at the Presidents Place Galleria, a sort of office/retail building in Quincy. 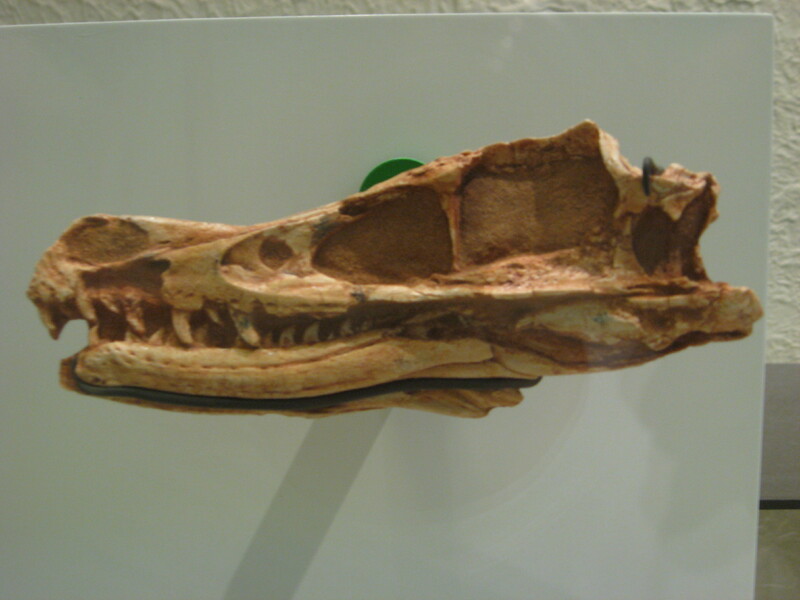 I think ANHP is in the process of moving to new digs, but until then you won’t find much in the way of an exhibit. What you will find is an excellent film narrated by Laura Linney, which offers an overview of four generations of Adams family history, from the American Revolution all the way to the Gilded Age of Henry and Brooks Adams. 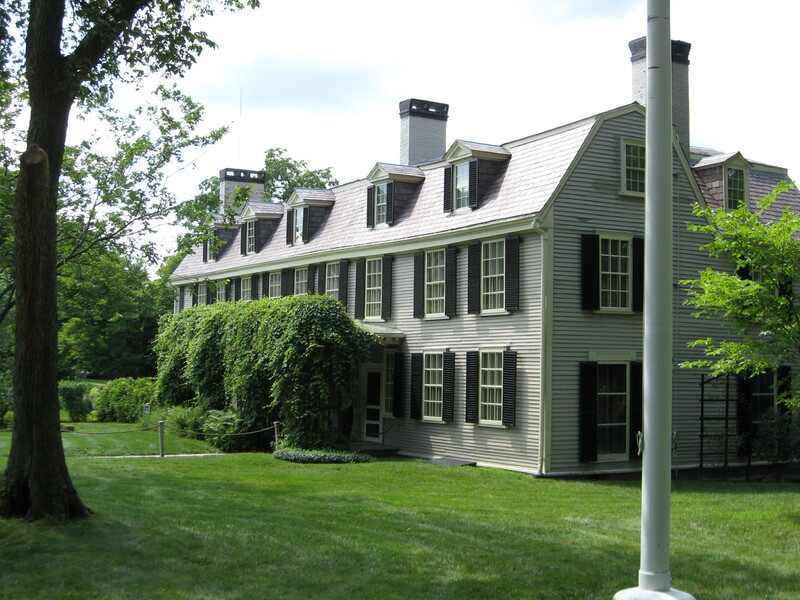 Just across the lawn sits the house where John and Abigail set up housekeeping and where John started his law practice, made a political name for himself as America and England headed toward war, and wrote the Massachusetts Constitution. Their son John Quincy was born here, too, so you’ve got two presidential birthplaces less than eighty feet apart. 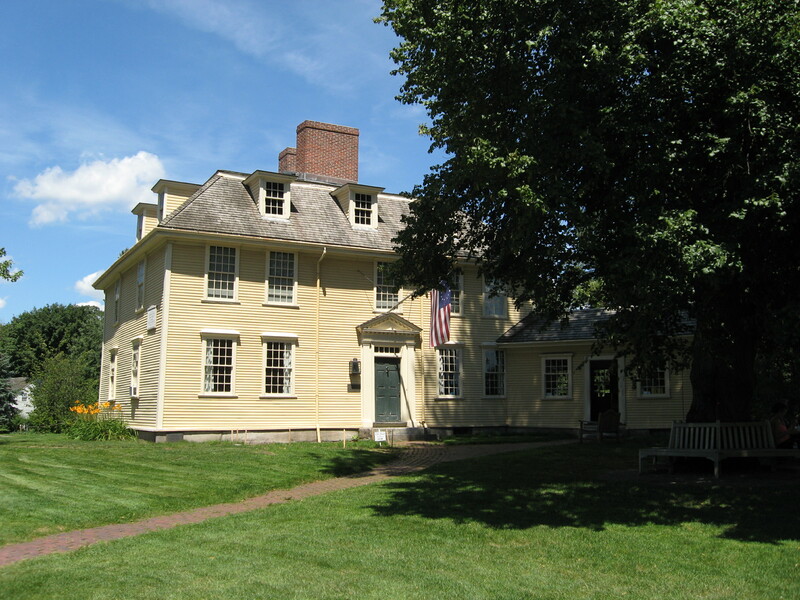 The third home, and the focus of the tour, reflects the elevated stature the Adamses enjoyed due to John’s public service in the Revolution. Peacefield, or the “Old House,” is the home John and Abigail bought while overseas, and served as the family seat until 1927. The house still has many original furnishings, and each room boasts a mixture of items from all four famous generations of the Adams family. Some of these items are priceless. I was especially excited to see the desk where John Adams wrote the letter that mended his relationship with Thomas Jefferson, initiating one of the most remarkable bodies of correspondence in American history. Some of ANHP’s most valuable assets aren’t in the collection at all, but walking around in uniform. The guides are some of the best interpreters working at any historic site I’ve ever visited; their knowledge is encyclopedic and their delivery is polished and engaging. I’d venture to say that our tour of Peacefield was probably the finest historic house tour I’ve ever taken. The ranger was in total command of his subject matter and his audience. It’s no small thing to master the history of an entire family when the family in question produced two presidents, some accomplished diplomats, and one of the country’s most distinguished men of letters. 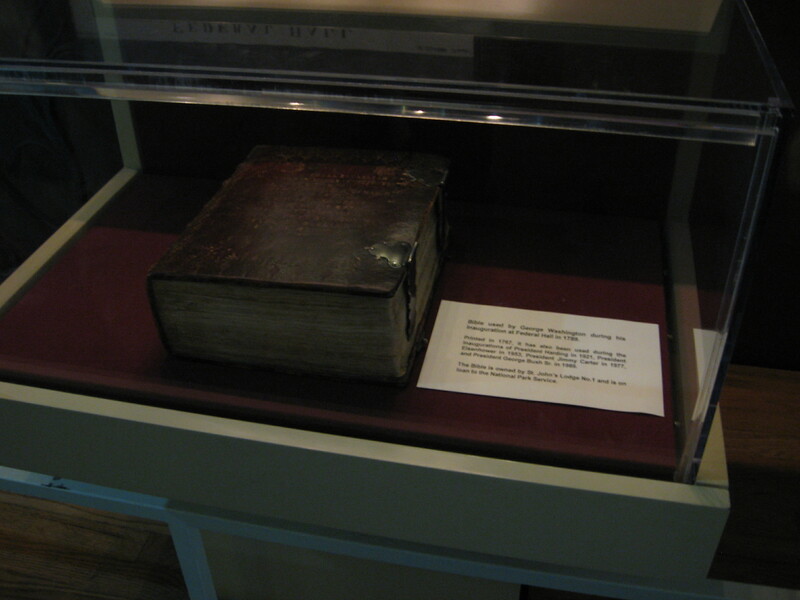 There are a couple of other neat Adams-related things to see in Quincy. 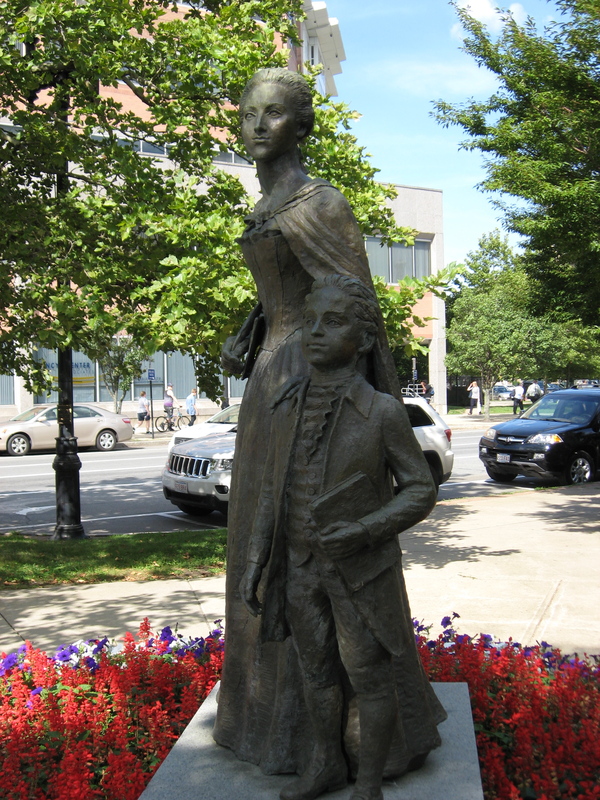 A nice statue of Abigail and a young John Quincy stands not far from the visitor center. And you’ll definitely want to set aside some time for a tour of United First Parish Church, which is just across the street. 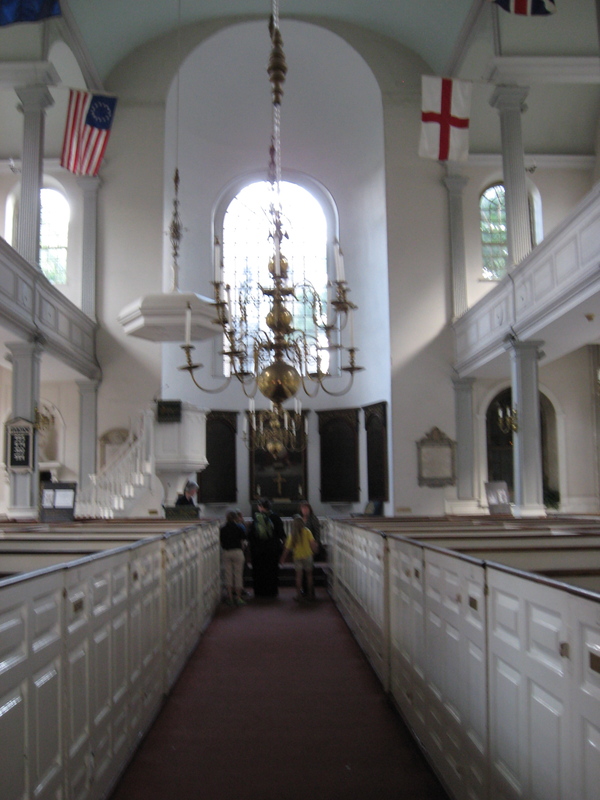 Established as a Puritan church in the 1630’s, it became a Unitarian congregation in the 1700’s. The current building, with its columned portico and a sanctuary with a beautifully carved ceiling, dates from 1828. 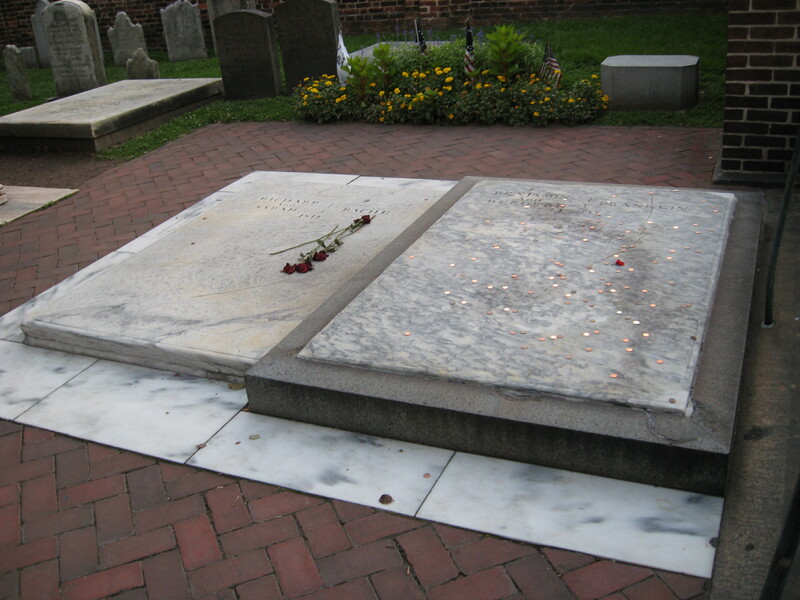 John, Abigail, John Quincy, and Louisa Catherine Adams are all laid to rest in the crypt. Our tour guide took us inside the burial chamber, a small, stone room with a low ceiling whitewashed walls. It’s about as intimate an experience with history as you can have. I should’ve taken a picture, but it just didn’t seem right to dig my camera out with two sets of presidents and first ladies lying there. 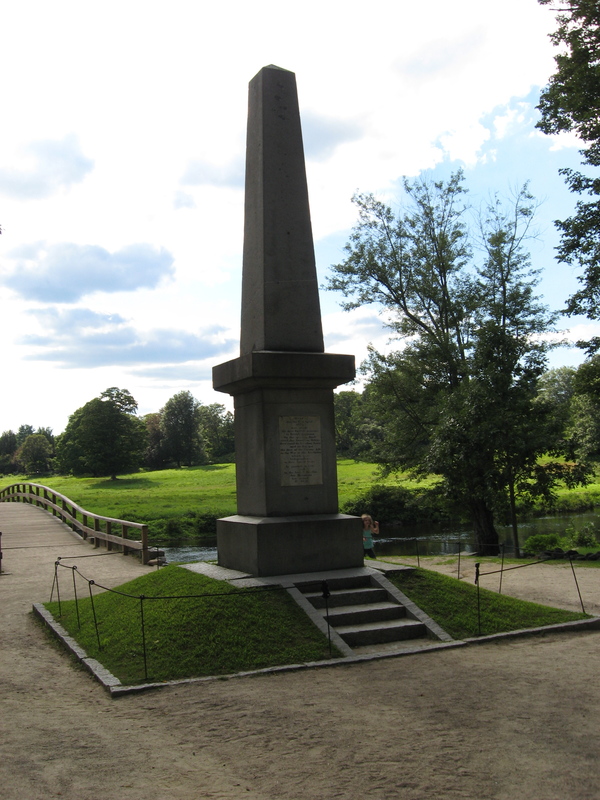 I think I was even more psyched about visiting Lexington and Concord than doing the Freedom Trail. It’s a must-see for anybody interested in the Revolution, and Paul Revere’s Ride was one of the first books I read after I switched my major to history in college. 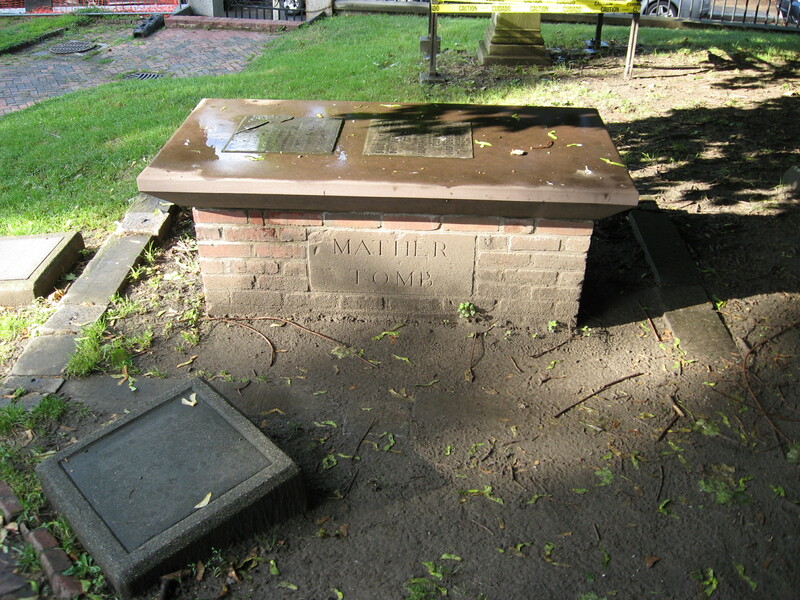 Minute Man National Historical Park holds much of the important real estate involved in the Revolution’s first fight, although Lexington Common is town property and therefore outside the park’s bounds. 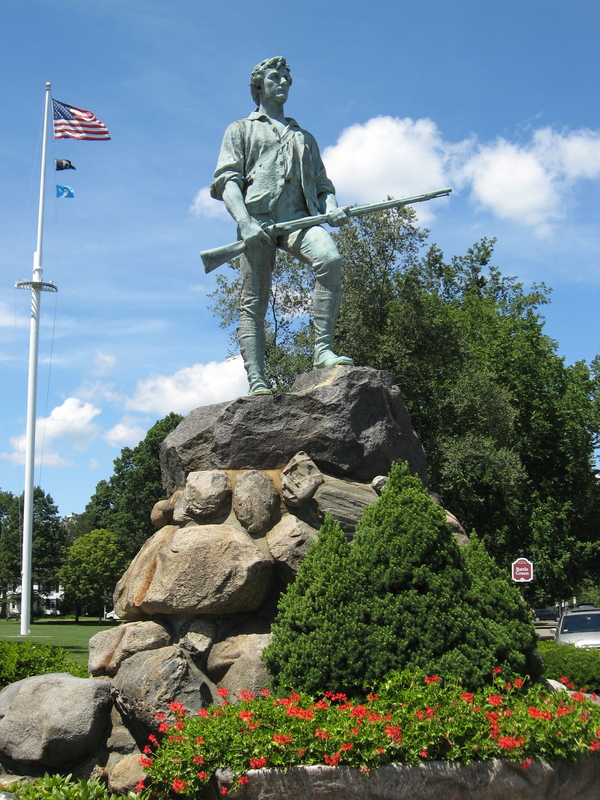 …and the iconic statue of a militiaman. The Lexington Historical Society operates three historic buildings in the town as museums. 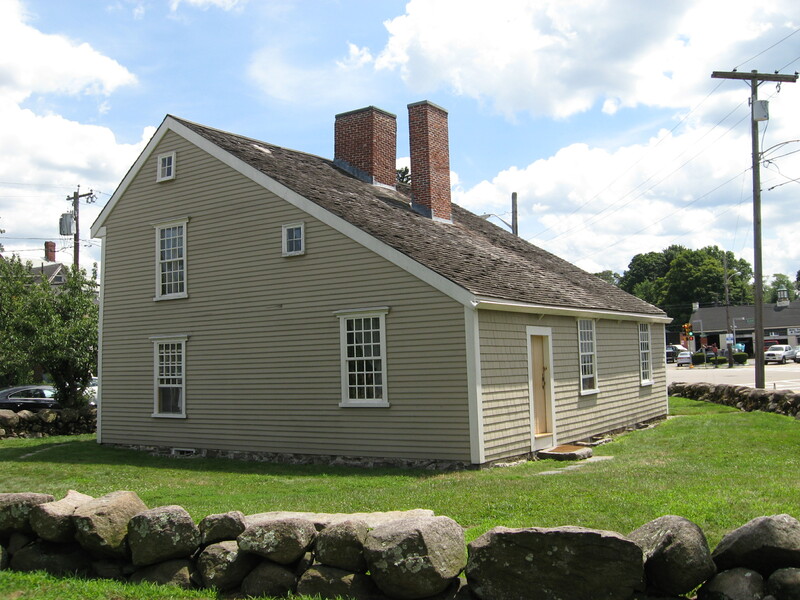 We took a tour of Buckman Tavern, which is right beside the green. 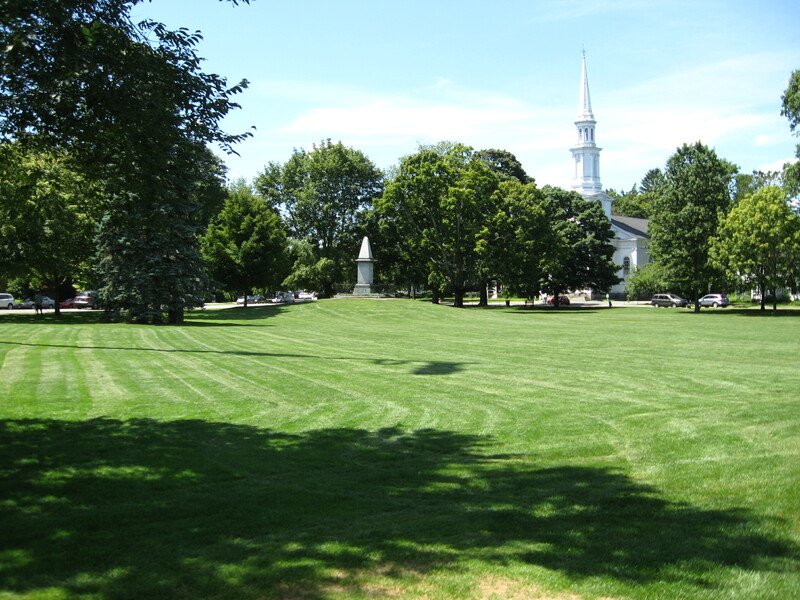 In the wee hours of the morning on April 19, 1775 the town’s minutemen awaited the arrival of the British here. It’s one of the best historic building tours I’ve ever enjoyed; the tavern is beautifully restored, and our guide was outstanding. 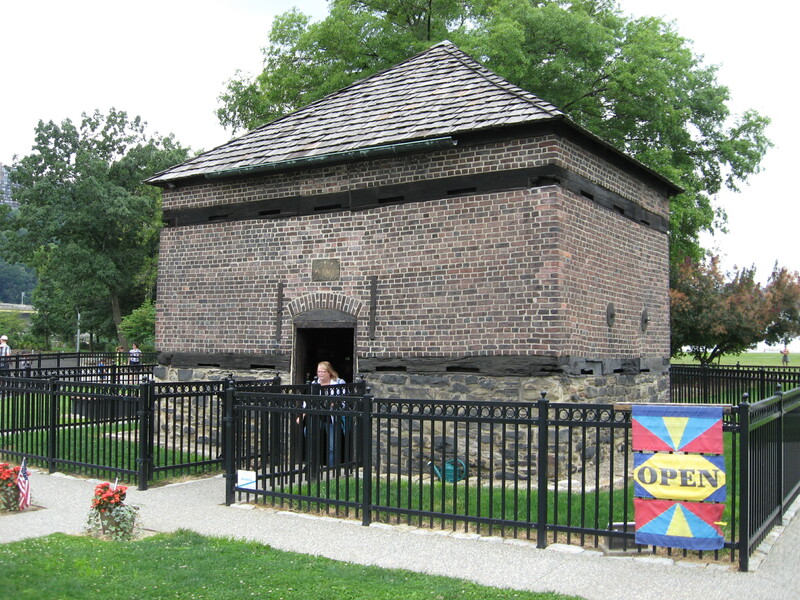 Heading west from Lexington brings you to Minute Man Visitor Center near the eastern entrance to MMNHP. 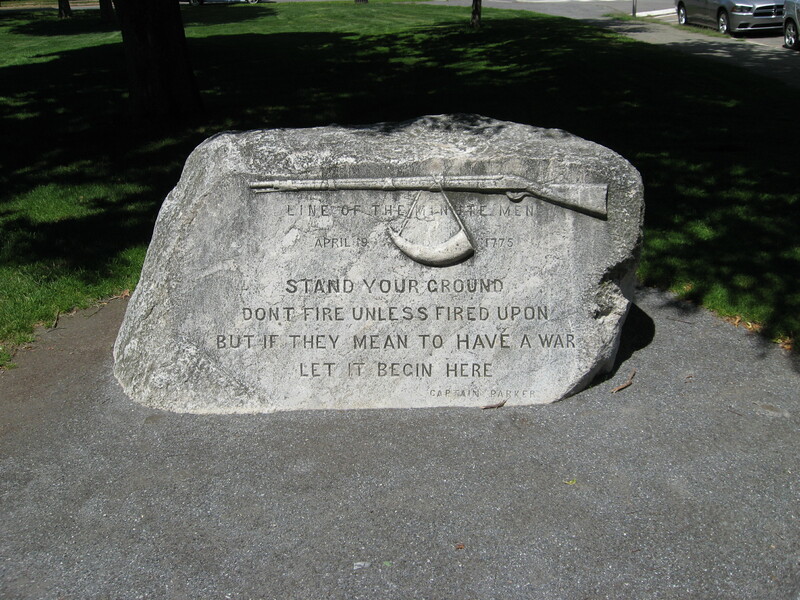 Here you’ll find a small exhibit on some of the battle’s participants and an innovative multimedia presentation that gives you a great overview of the Revolutionary War’s beginnings. It’s similar to some of the shows at the Abraham Lincoln Library and Museum in Springfield, and very engaging. 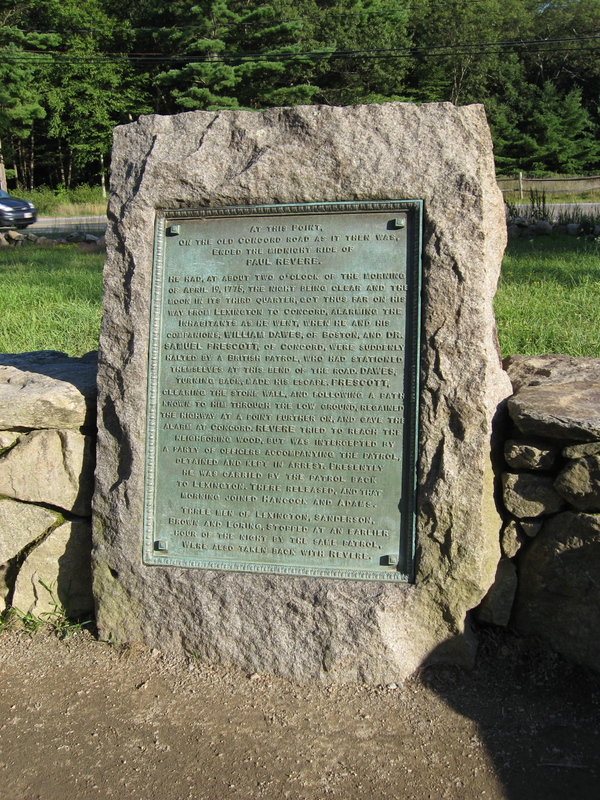 There’s a five-mile trail tracing part of the route of the running battle between the militia and the British regulars with stops at a few key points, like the Revere capture site. 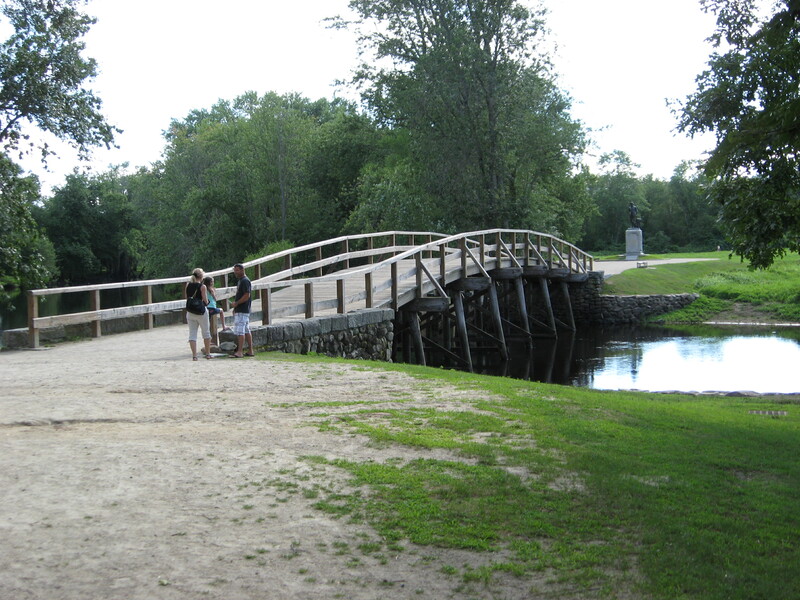 The park has another visitor center near Concord’s North Bridge. 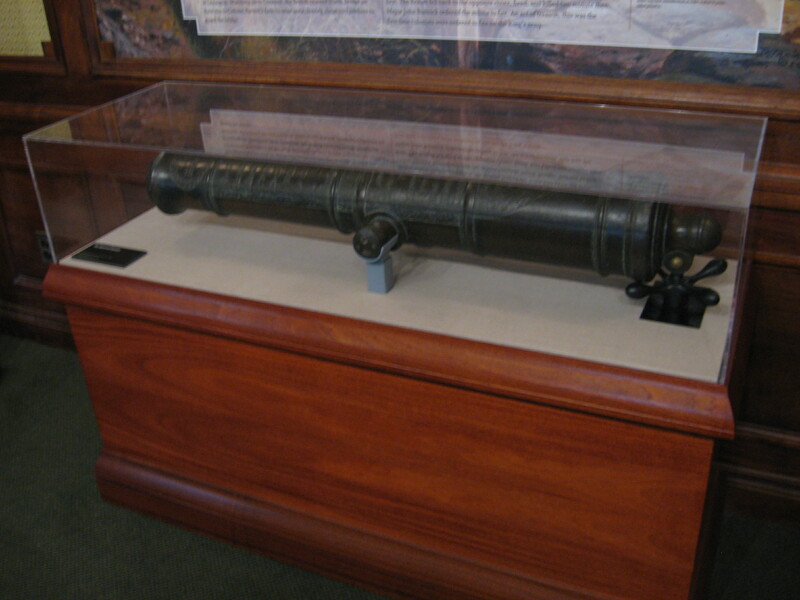 Among the artifacts displayed here is “the Hancock,” one of the cannons stashed away in Concord that the British hoped to recover on their ill-fated mission. 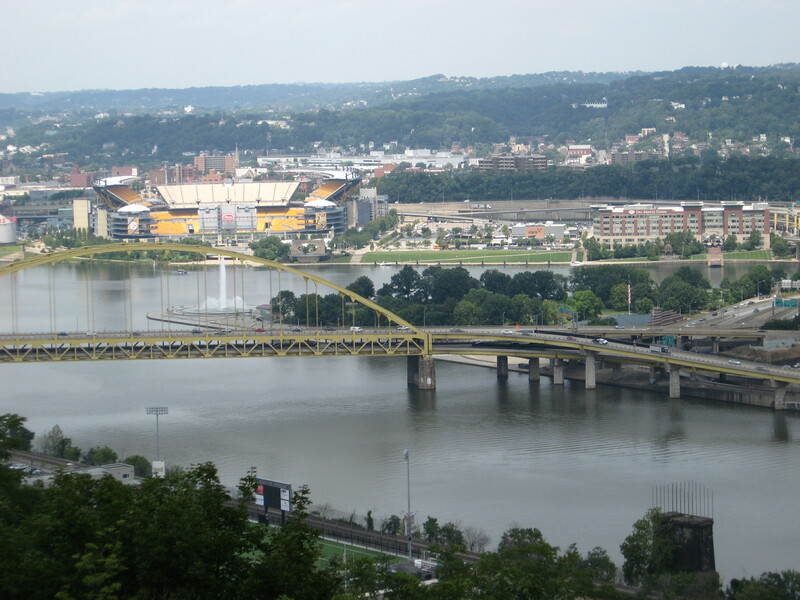 There are three monuments worth noting near the bridge. 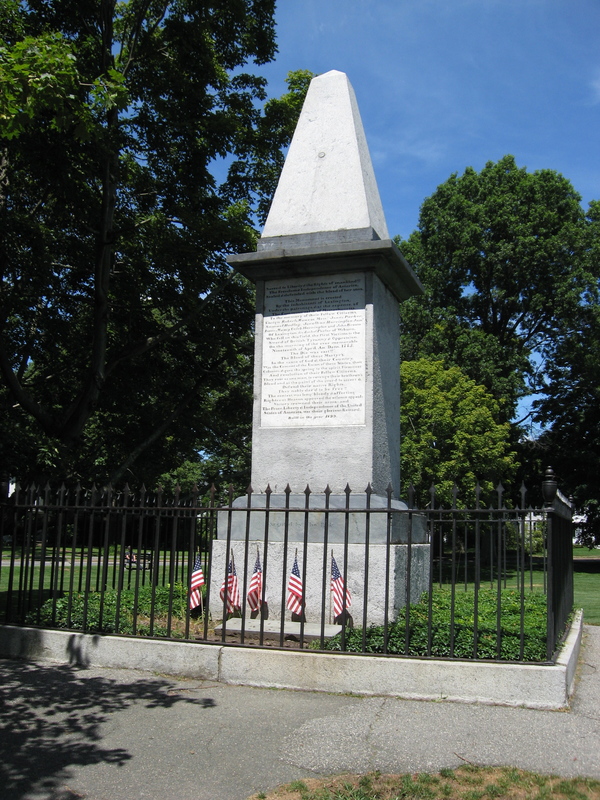 Emerson’s famous Concord Hymn was written for the dedication of the first one, an obelisk erected in 1836. 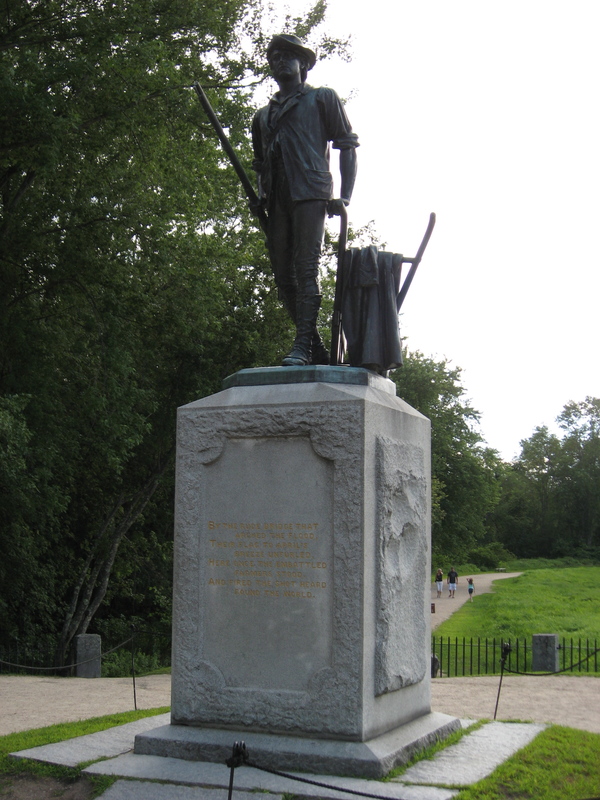 Daniel Chester French’s impressive statue of a militiaman was cast from seven Civil War cannons. 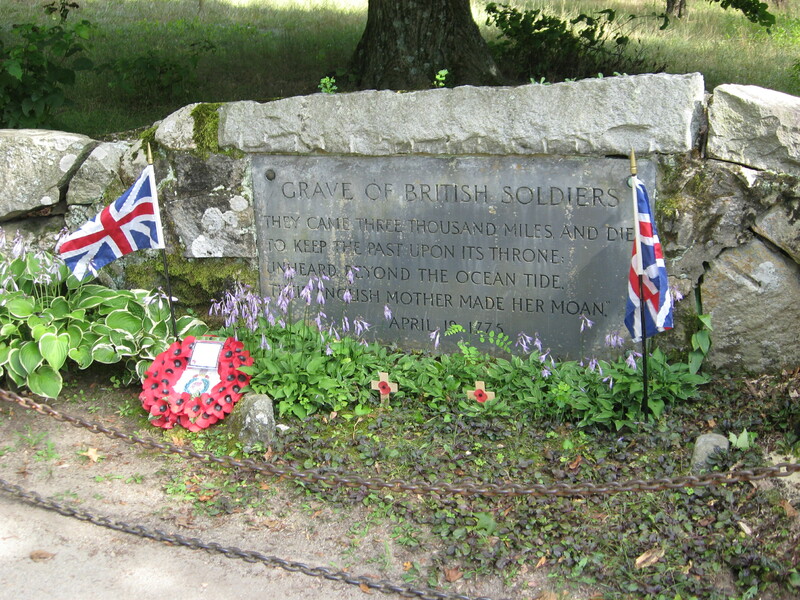 Finally—and the most impressive one to me—is the grave marker for two of the British soldiers killed at the bridge fight. I’ve been back home long enough to recuperate from two weeks of sightseeing, so it’s time for that most venerable of all end-of-vacation traditions: forcing a captive audience to look at your photos. 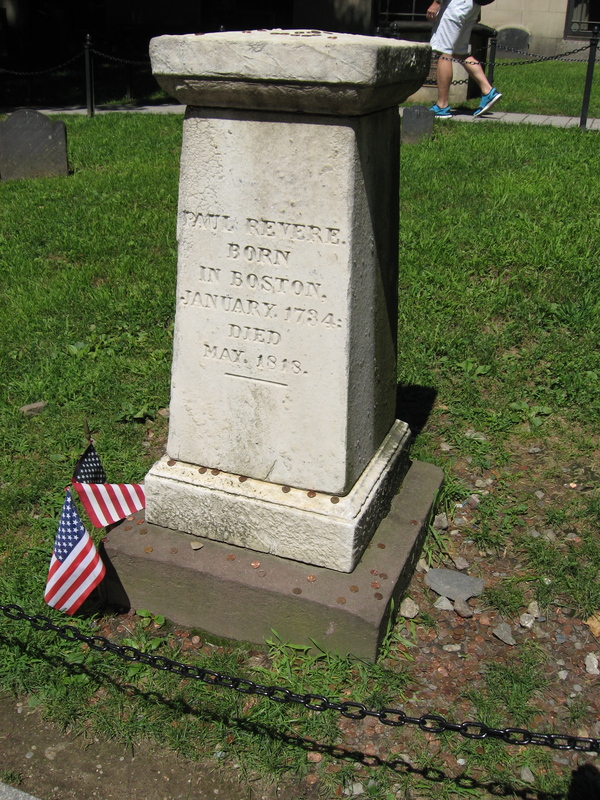 My friend Ryan and I set out on the Freedom Trail about 2:00 in the afternoon. Because there’s so much to see between the starting point on Boston Common and the end point at Bunker Hill, and because it was already so late in the day, I had told Ryan that we’d never be able to do the whole thing that afternoon, and that we should plan on picking up where we left off the next day. Thing is, Ryan played basketball and tennis in high school and has never lost his competitive streak. 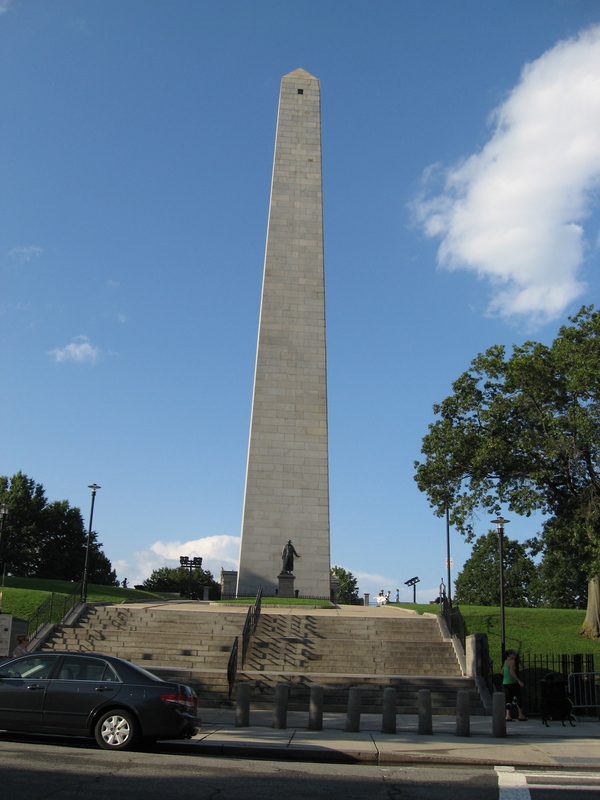 Apparently in an effort to set some sort of record, he announced that we were going to stand on Bunker Hill that very day, come hell or high water. One of the first things you see on the trail relates to the Civil War rather than the Revolutionary one. 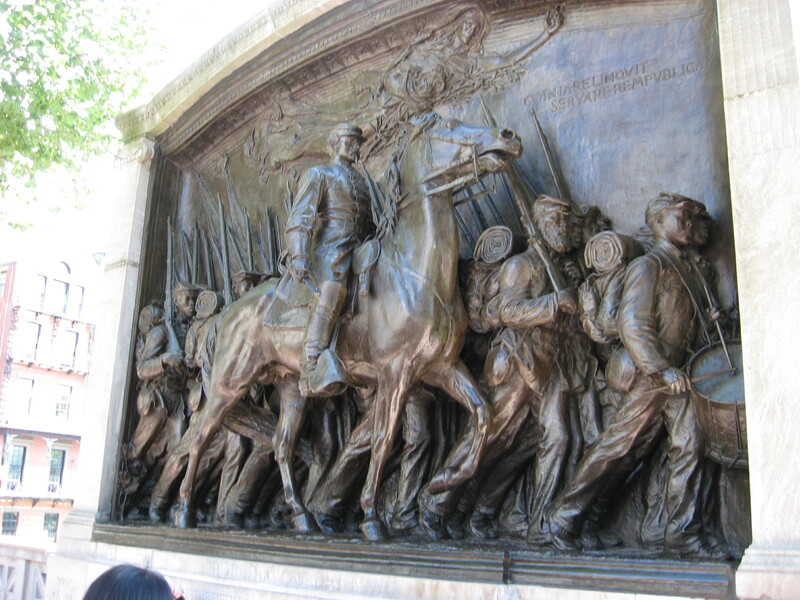 It’s one of my favorite works of commemorative sculpture, the monument to Robert Gould Shaw and the 54th Massachusetts on Boston Common, right across from the State House. Boston seems to be embracing the history of abolitionism pretty enthusiastically. I’m not familiar enough with abolitionism to know how widespread serious anti-slavery sentiment in the city actually was, but I suppose it’s a handy way to embrace the legacy of the Civil War when most of the actual fighting took place hundreds of miles away. 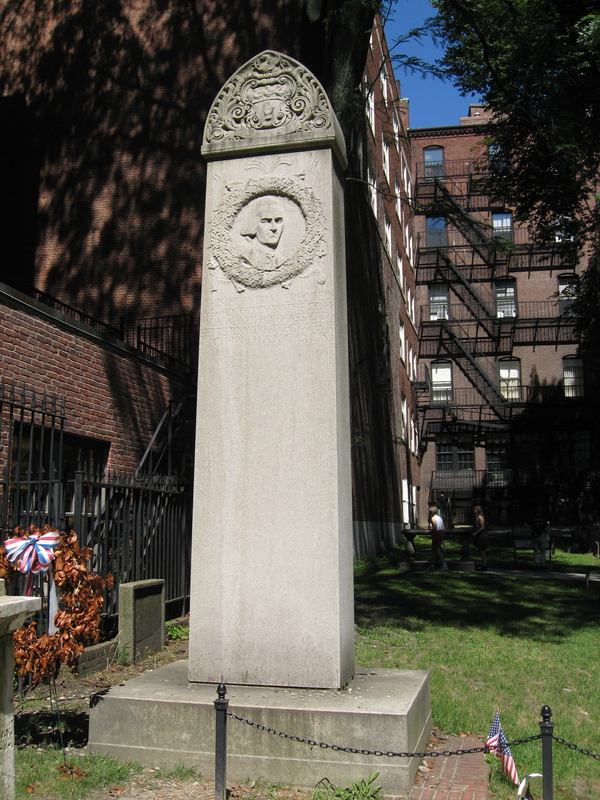 And speaking of the history of abolitionism, just a stone’s throw from the Shaw Monument is Park Street Church, where William Lloyd Garrison gave his first major anti-slavery speech in 1829. Step over to the other side of the church, and you’re also stepping back in time—two hundred years before the outbreak of the Civil War, in fact. 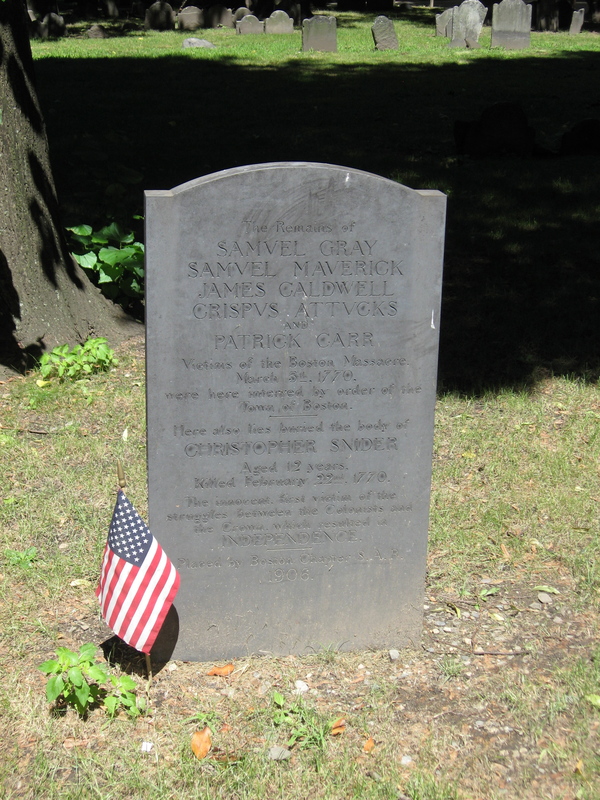 Granary Burying Ground dates all the way back to 1660. 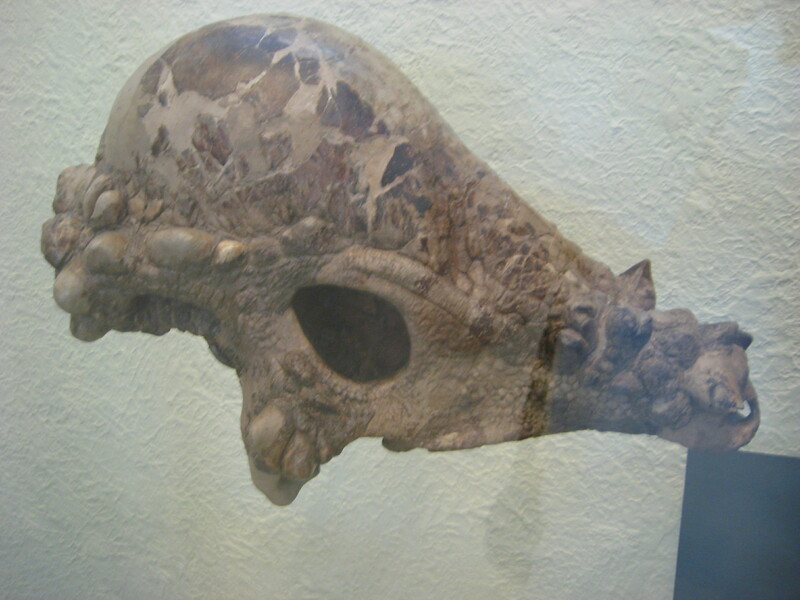 Its age is apparent from the winged skulls carved on some of the tombstones, a very old motif that’s characteristic of early American grave markers. Again, bear in mind that I’m used to touring regions where “old” means 1790-ish. 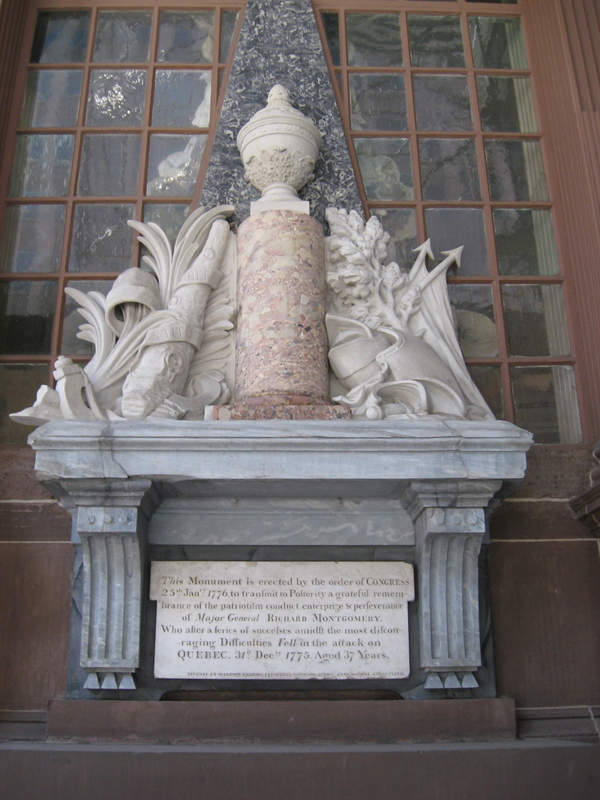 …and the victims of the Boston Massacre. All in the same graveyard! 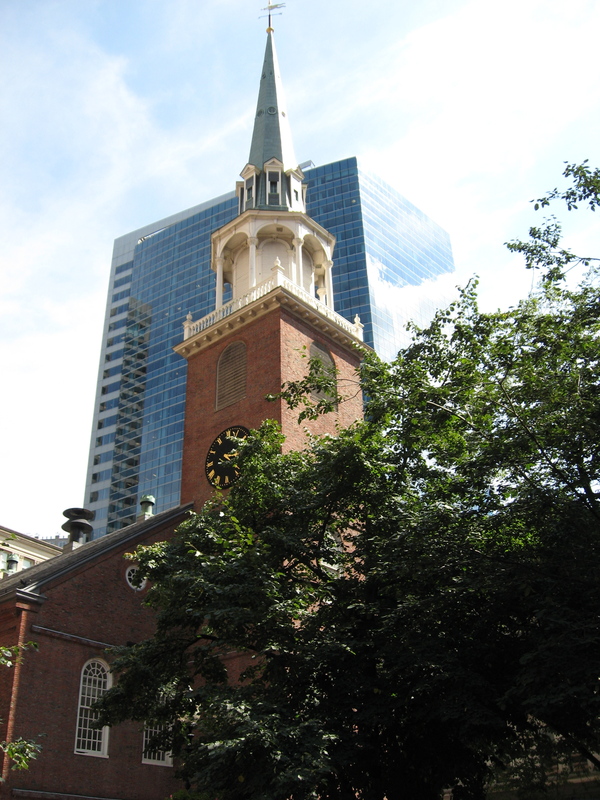 The Old South Meeting House is probably best known as the launching pad for the Boston Tea Party, but that was just one of many highlights in this building’s long history of playing host to protest and dissent. 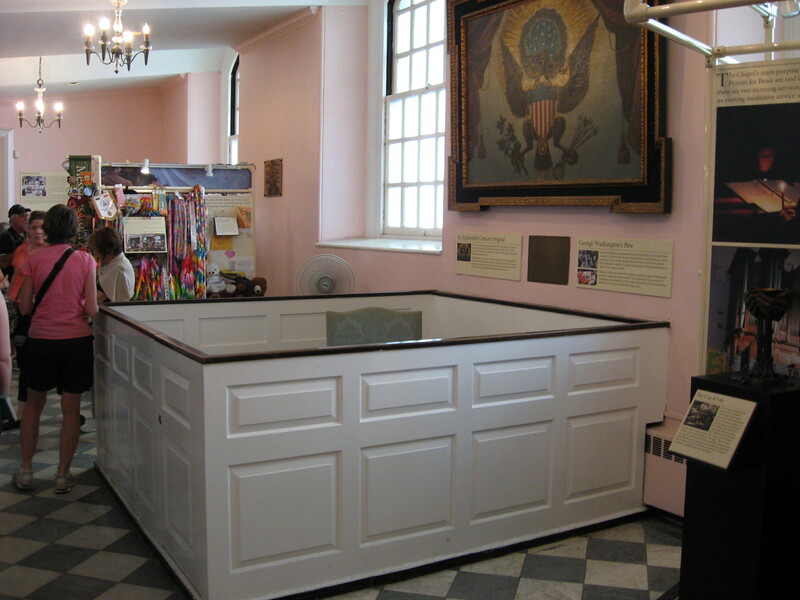 An exhibit inside the sanctuary details this history, from the imperial controversy to abolitionism, female suffrage, and the Sacco and Vanzetti trial. British troops used the church as a riding stable during the occupation of Boston, but it doesn’t look any worse for wear. 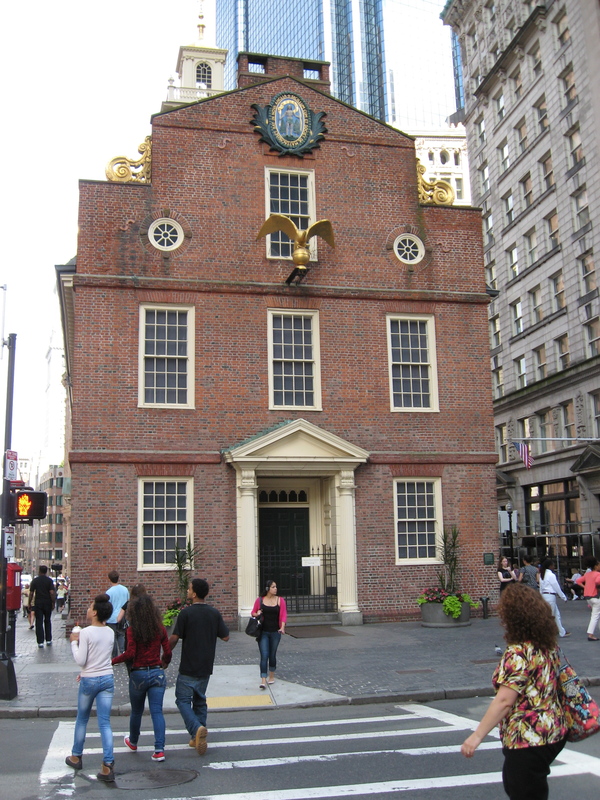 To me, a big highlight of the trail is the Old State House, seat of government in Massachusetts from 1713 to 1798 and now home to a museum that explores politics and public life in the Bay State from the colonial era through the nineteenth century. 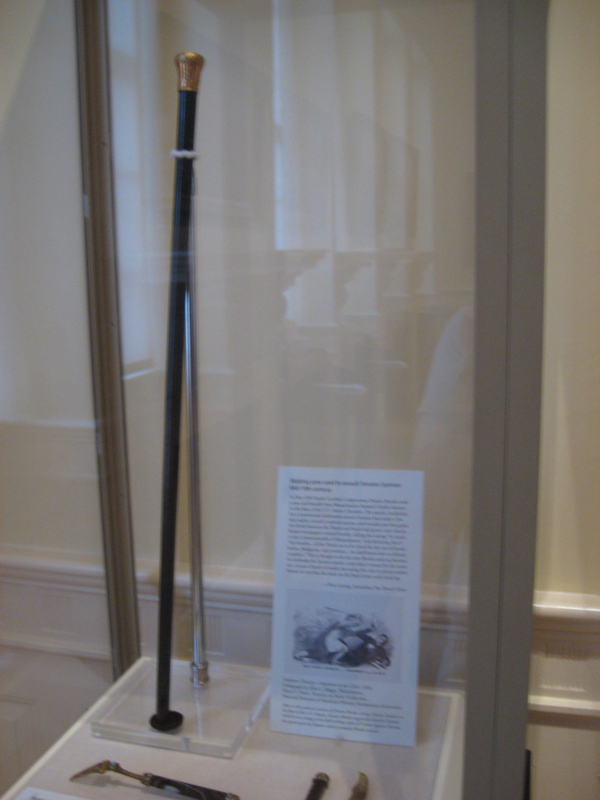 …and the cane Preston Brooks used to wallop Charles Sumner on the Senate floor. 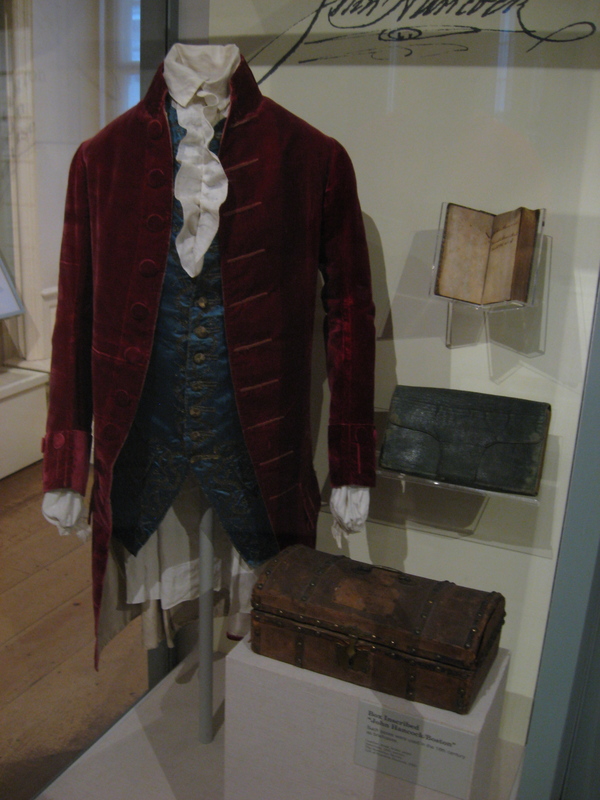 You’ll also find Indian treaty belts, rare documents, and artifacts from Bunker Hill on display here. Great stuff. 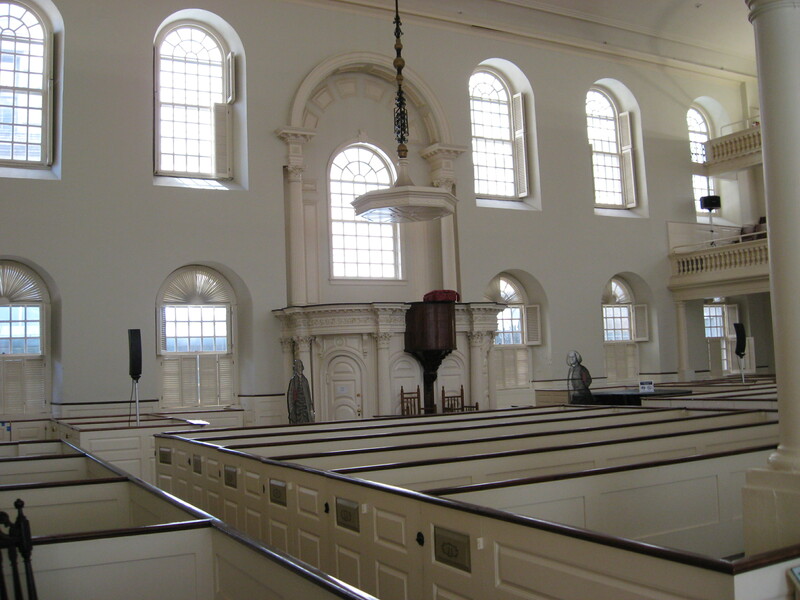 If you’re rushed for time on the Freedom Trail and you’ve only got time to tour one building interior, my personal opinion is that you should do this one. 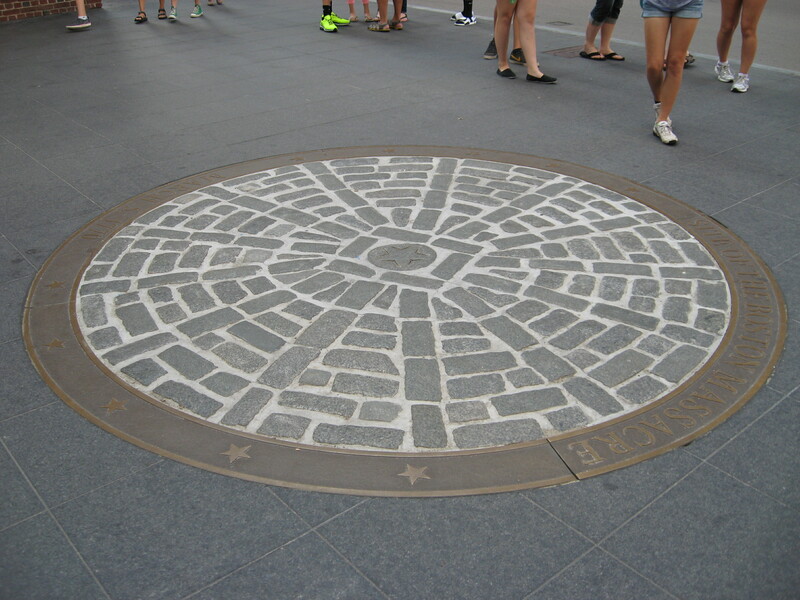 Right outside the State House is a circle of bricks marking the site of the Boston Massacre. This seems to be the popular spot for tourists to take their “Look-Ma-we’re-doing-the-Freedom-Trail” photos, with their arms spread wide and big grins on their faces. I’m not sure how I feel about this; 1770 was a long time ago, but geez, five guys did die here. 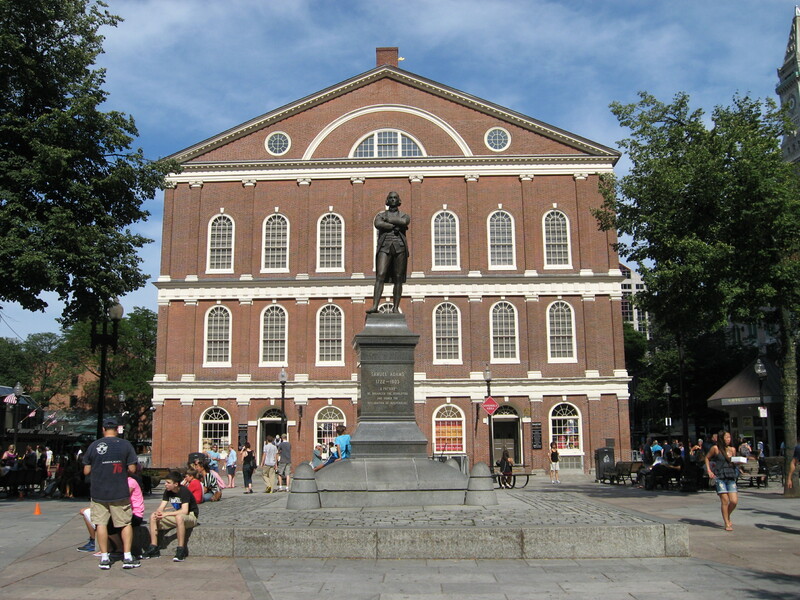 Next stop is Faneuil Hall, a most appropriate place for a statue of Sam Adams. The marketplace in and around this site is a great place to pick up souvenirs. 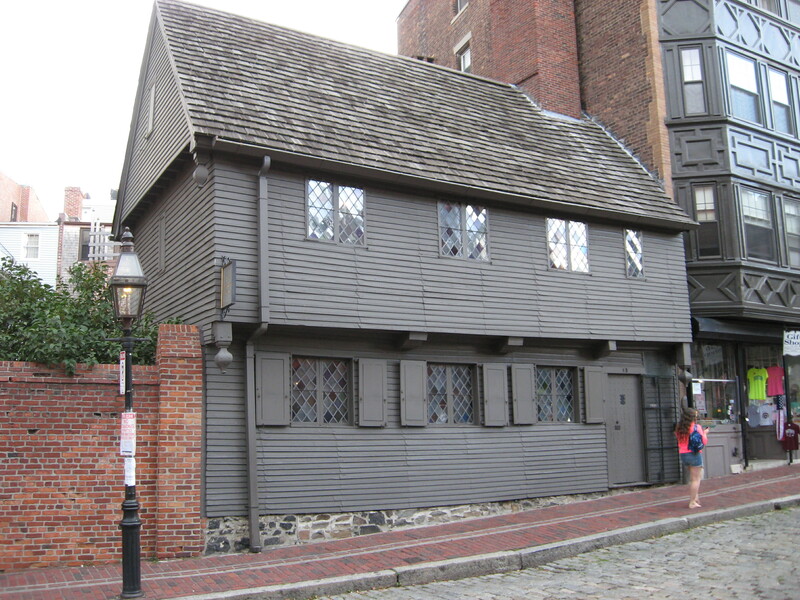 Paul Revere’s house would be a neat thing to see anyway, but it’s of significant architectural interest even without the celebrity name recognition. Built around 1680 on the site of Increase Mather’s parsonage, it was already old by the time Revere bought it. 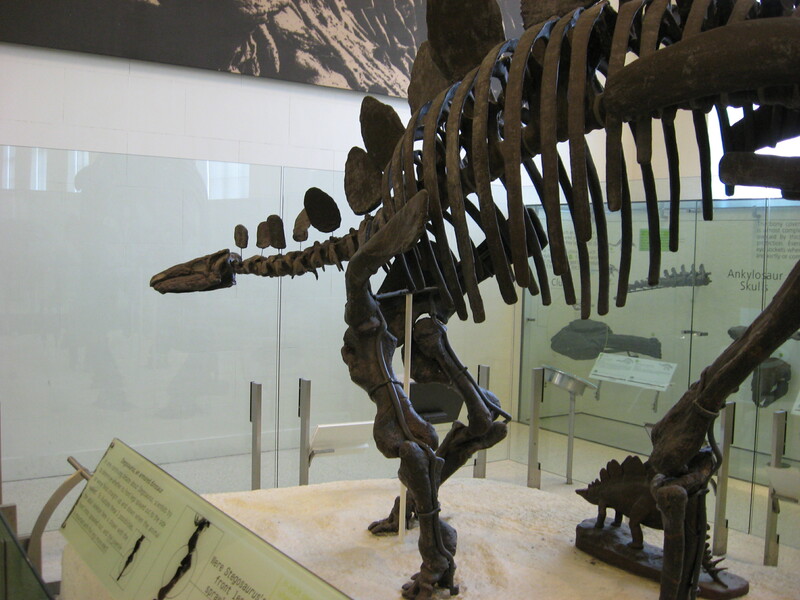 It’s pretty small, so the self-guided tour doesn’t take very long. 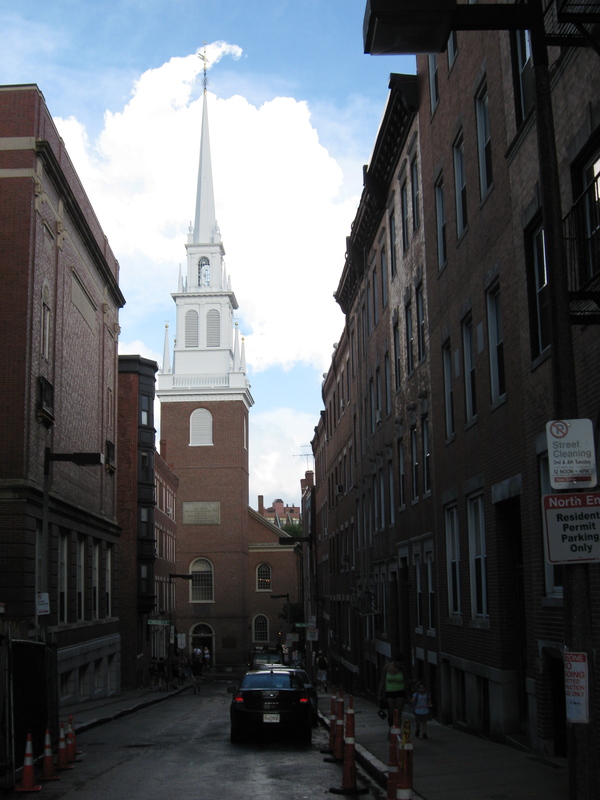 Not far from the house is another structure inextricably linked to Revere: Old North Church. 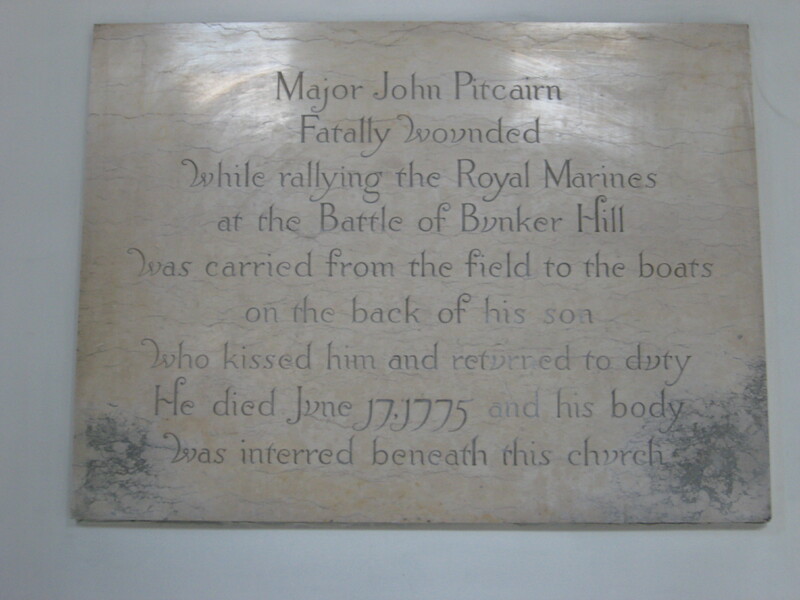 Among those buried in the crypt is Maj. John Pitcairn, who received a mortal wound at Bunker Hill. 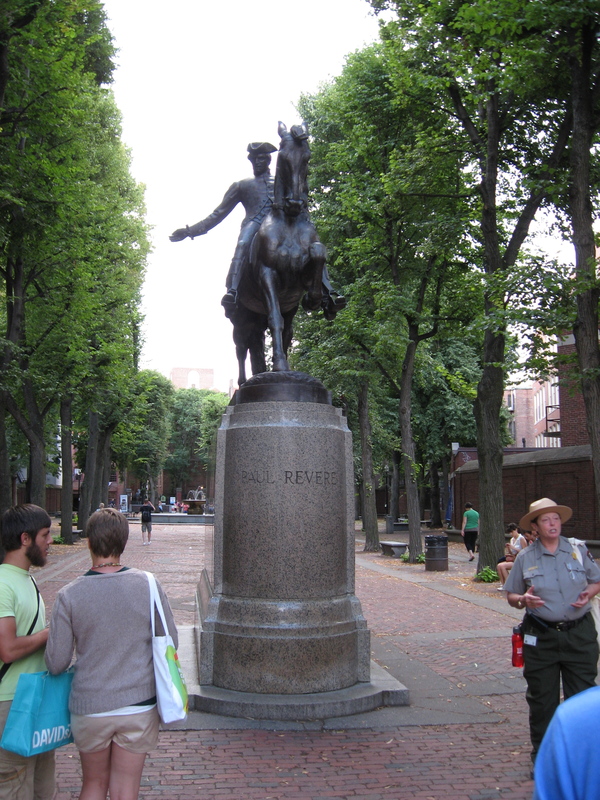 There’s an equestrian statue of Revere in a kind of courtyard outside the church. I highly recommend making an effort to visit this spot at night, with the courtyard dark and the steeple illuminated behind it. The cemetery on Copp’s Hill doesn’t have as many notable residents as Old Granary, but it’s still worth a visit. 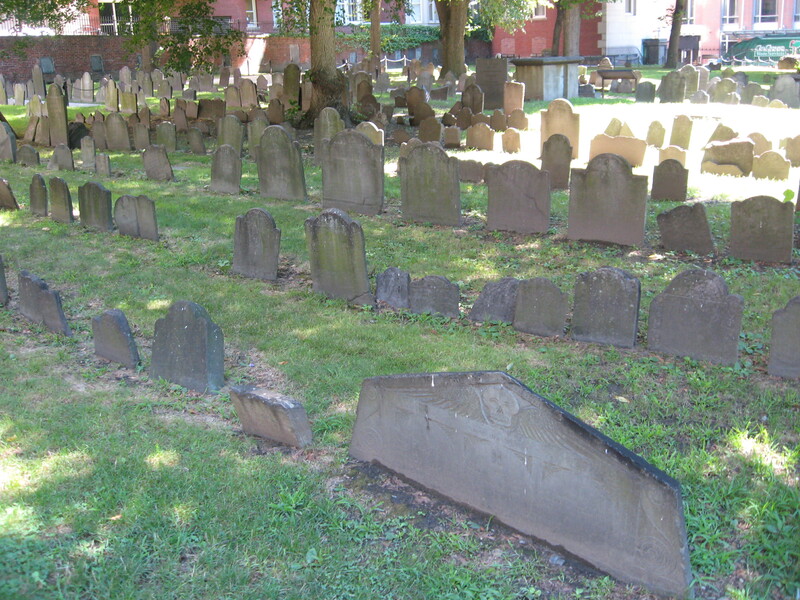 Increase and Cotton Mather are both buried here. Most of the sites on the trail are in pretty close proximity to each other, but getting to Bunker Hill (or Breed’s Hill, if you insist on geographical precision) requires a good bit of walking. I hadn’t been to many urbanized battlefields before this one, and it was hard to orient myself with all the buildings around. The monument is a lot more impressive in person than I’d expected; you can see it from quite a distance. Here’s one final recommendation. 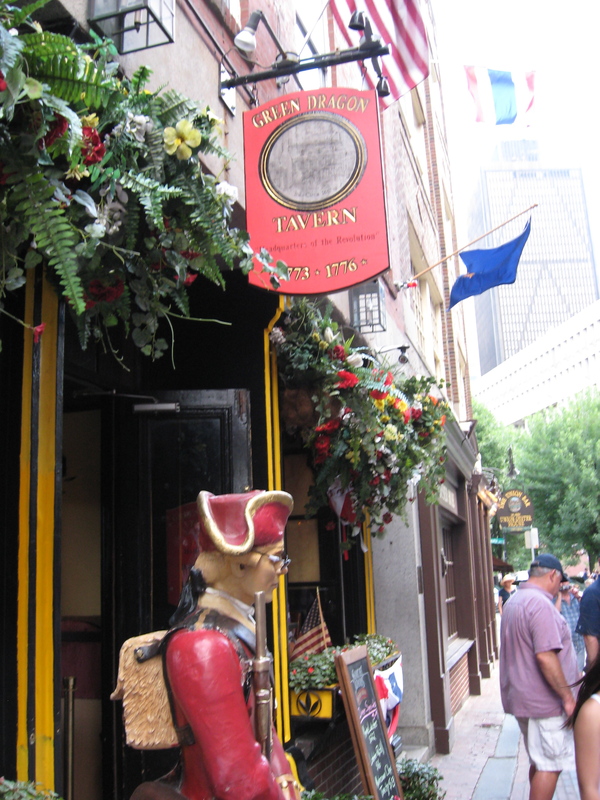 If you’re going to do the Freedom Trail, you should grab something to eat at the Green Dragon Tavern in the North End, not far from Revere’s house. Despite what their advertising implies, it’s not the same place where Joseph Warren, Paul Revere, and their buddies used to hang out, but the steak tips are still pretty darn good. Long story short, you can do the Freedom Trail in half a day, but you’d better be ready to do some serious huffing and puffing. The Constitution was closed that day, too, so that helped us shave off some time. 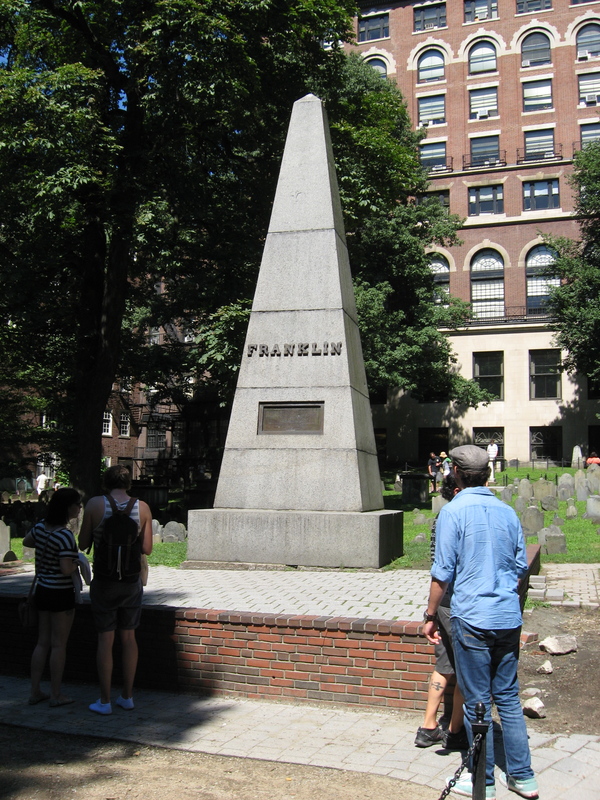 There are a number of guidebooks and audio tours available; we used the Freedom Trail Foundation’s official guide, which was excellent. 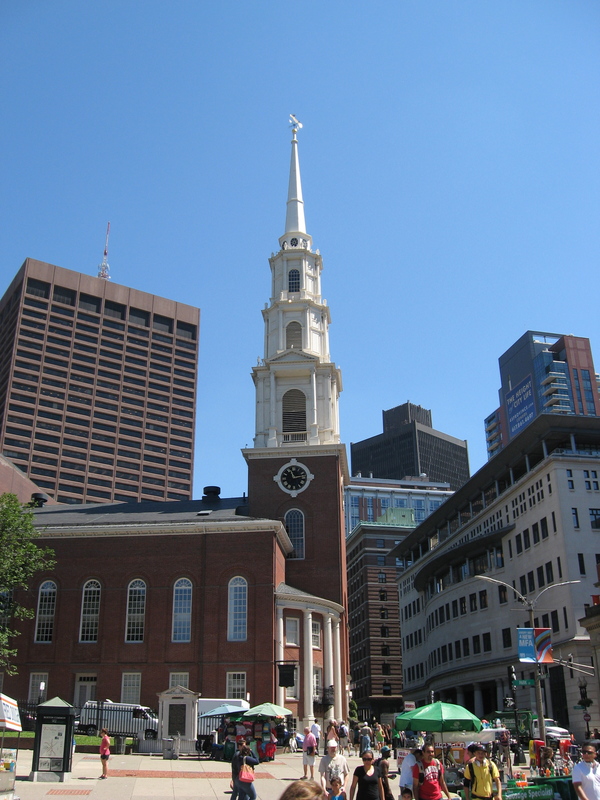 A lot of the sites along the way are either free or accept donations, but you can get a combination ticket for Old South Meeting House, the Old State House, and Paul Revere’s house at the small visitor center on Boston Common.